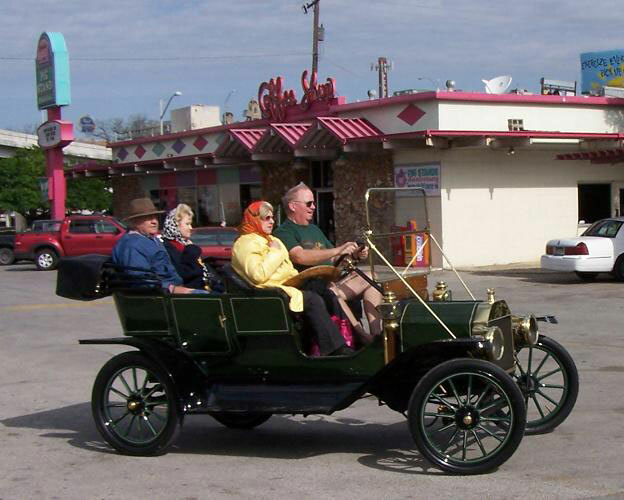 1909 Ford Model T Roadster, Jamie Musselman, San Antonio, TX. 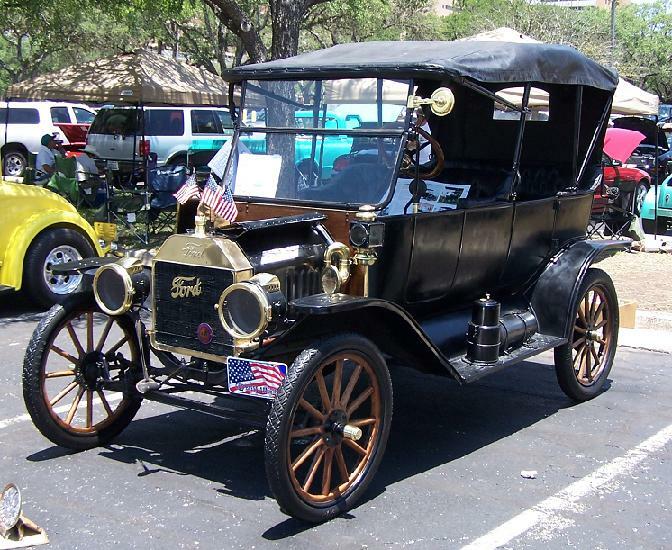 1911 Ford Model T Touring Sedan, Wade Smith, San Antonio, TX. 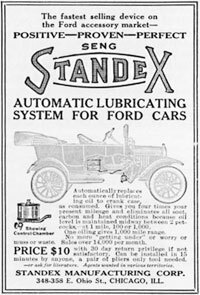 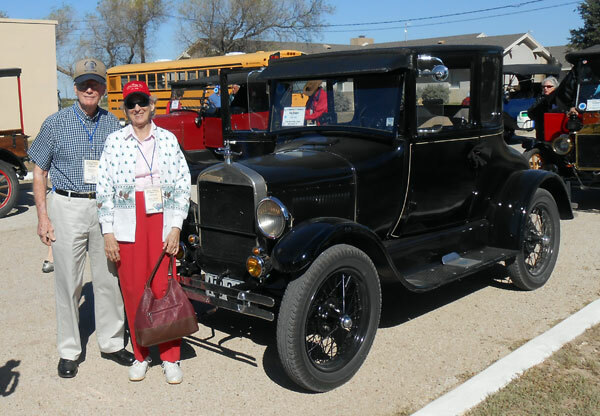 1911 Ford Model T Torpedo, Marshall and Diane Huling, San Angelo, TX. 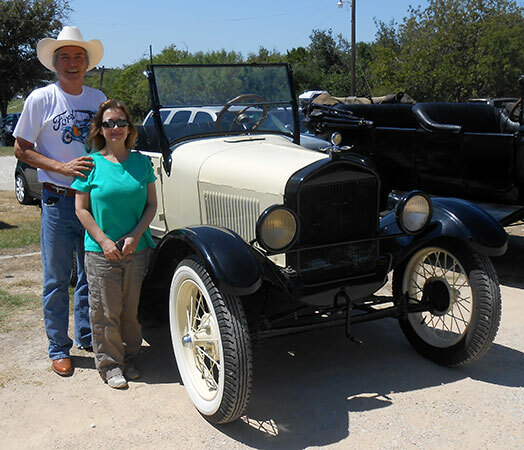 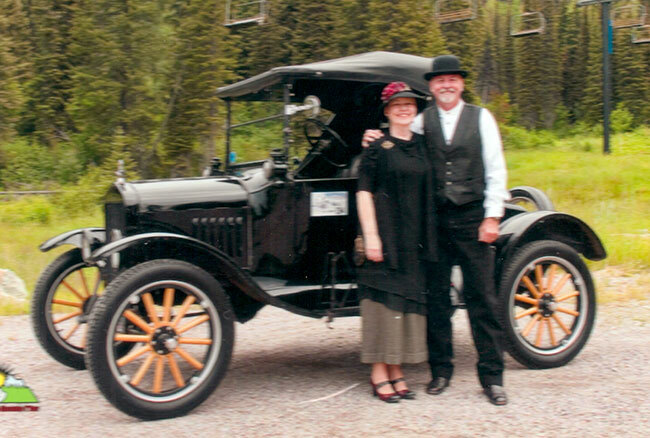 1911 Ford Model T 2 Seat Speedster, John and Diane Williams, San Antonio, TX. 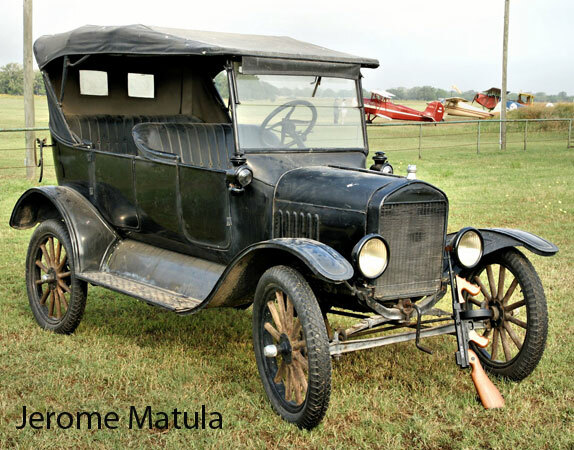 1912 Ford Model T Roadster/Runabount, Tom Campbell, Castroville, TX. 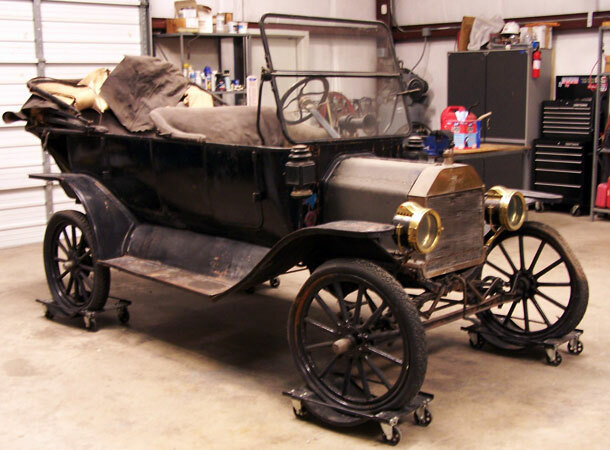 1912 Ford Model T Touring car, SAS Shoe Factory, San Antonio, TX. 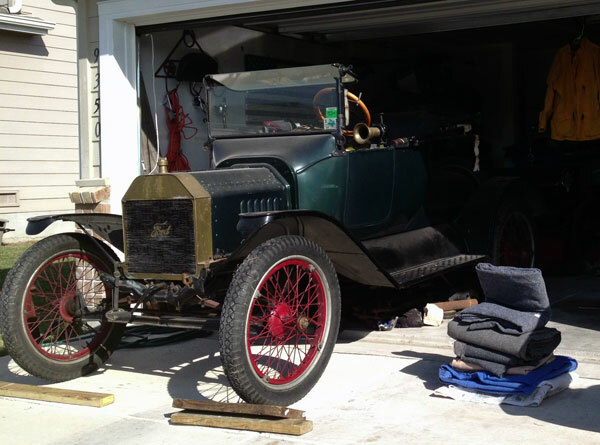 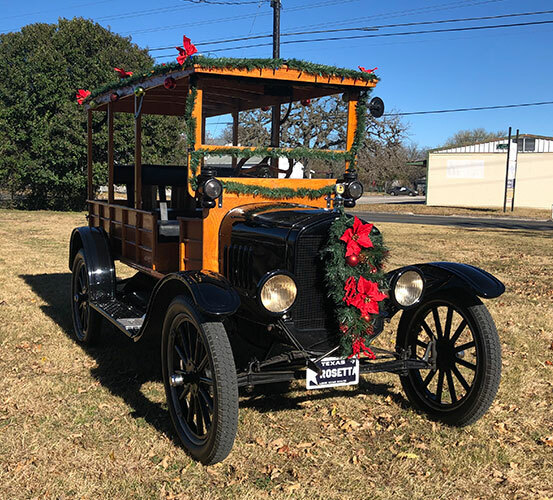 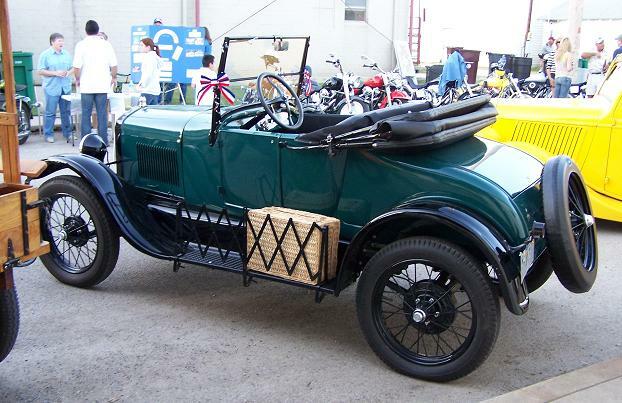 1912 4 Door Touring, Dan Judson, Schertz, TX. 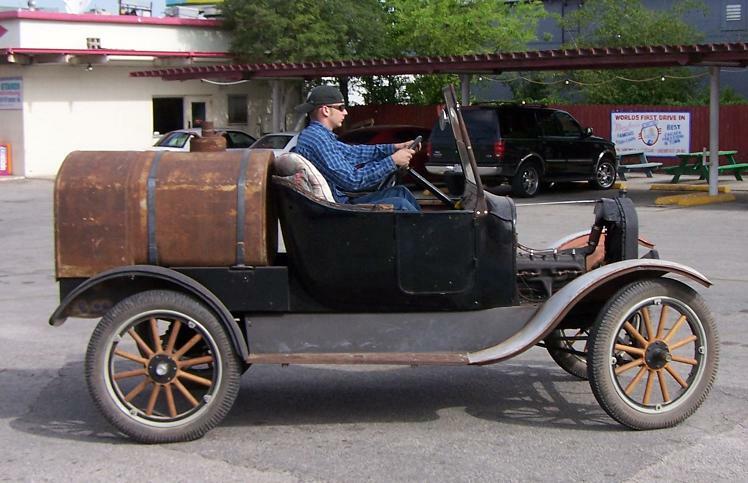 1912 Ford Model T Speedster, Bill Smith, San Antonio, TX. 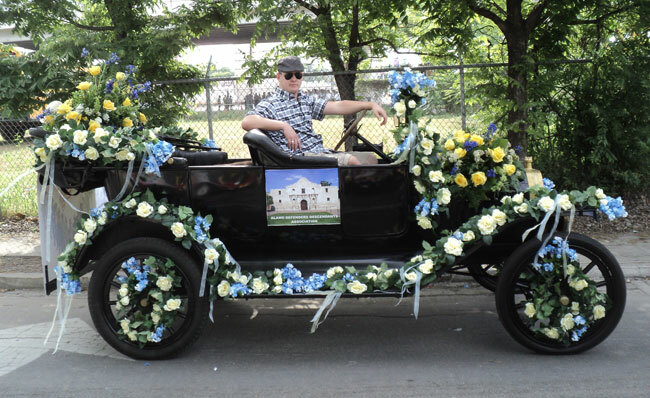 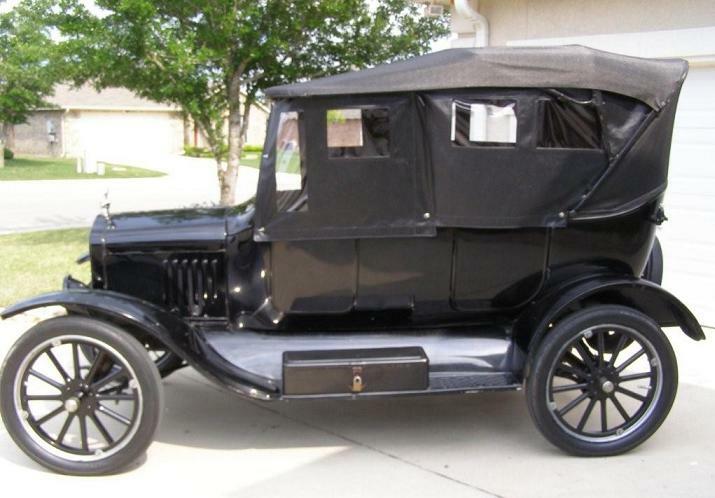 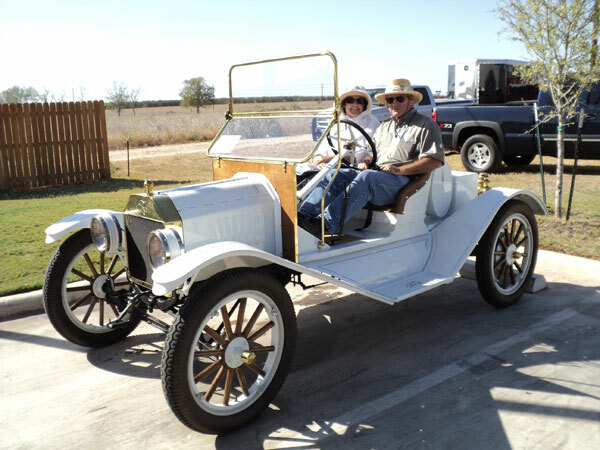 1913 Ford Model T Runabount, Buddy Holcomb, Corpus Christi, TX. 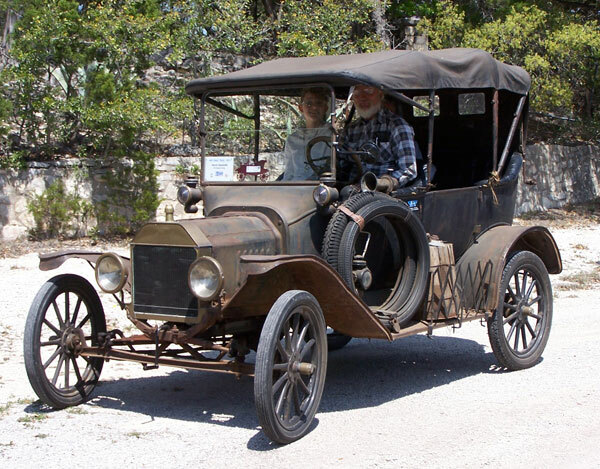 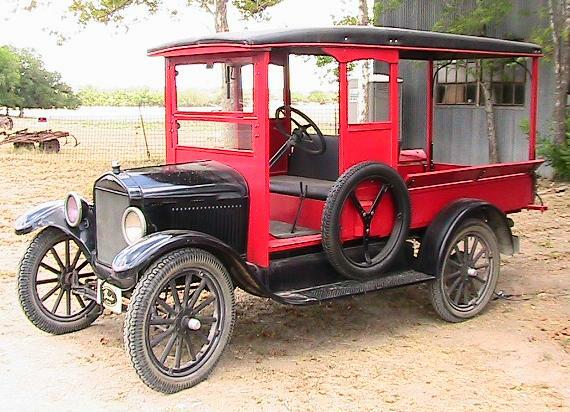 1913 Ford Model T Runabount, Burt Oatman, Bulverde, TX. 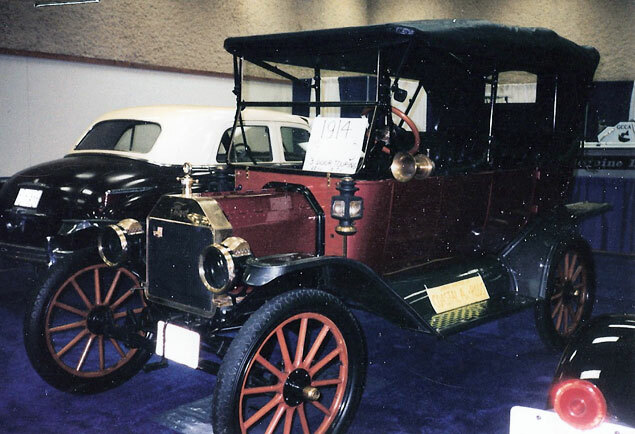 1914 Ford Model T Touring car, Danny Langston, San Antonio, TX. 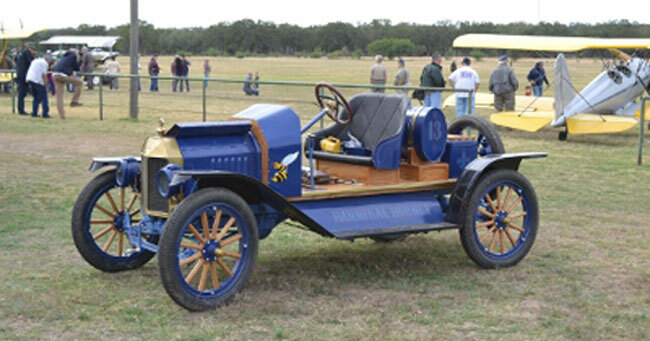 1914 Ford Model T Touring car, Ronnie Bitterly, San Antonio, TX. 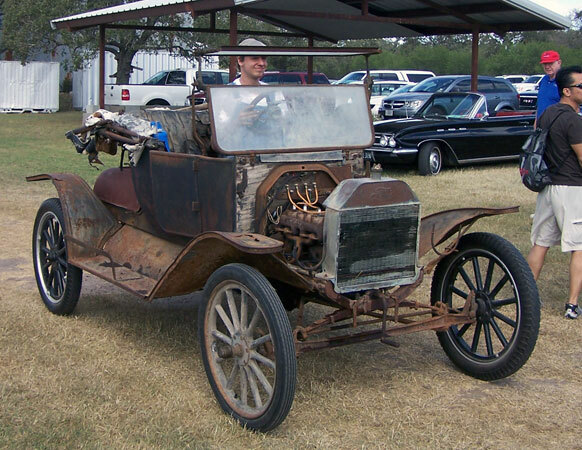 1914 Ford Model T Touring car, Mike Mackechney, San Antonio, TX. 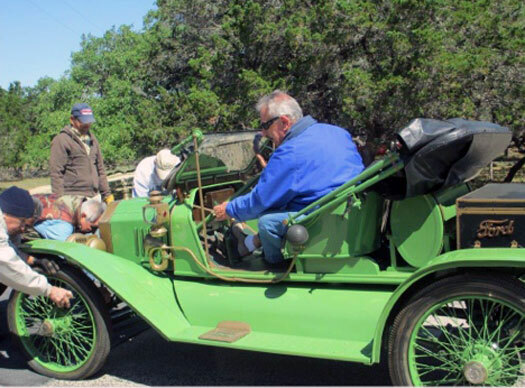 1914 Ford Model T Touring car, Stephen Martin, San Antonio, TX. 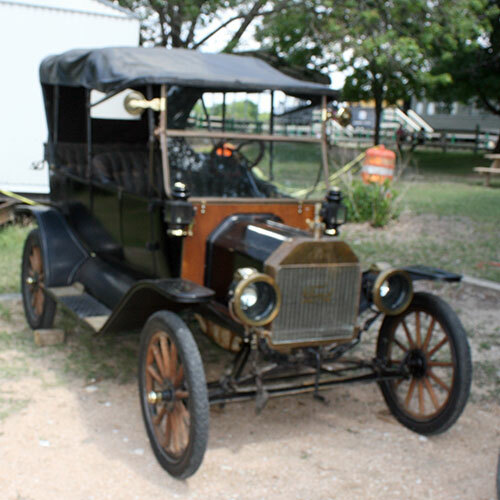 1914 Ford Model T Runabout, Sonny House, Lockhart, TX. 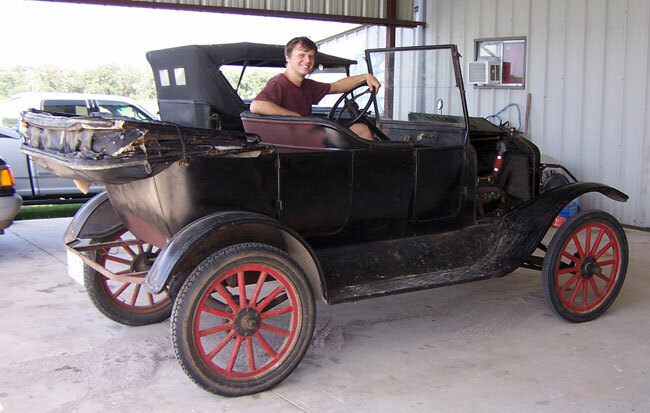 1914 Ford Model T Depot Hack, Anton Hajek, San Antonio, TX. 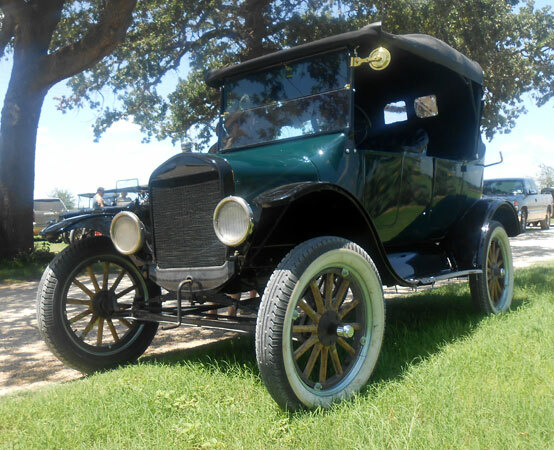 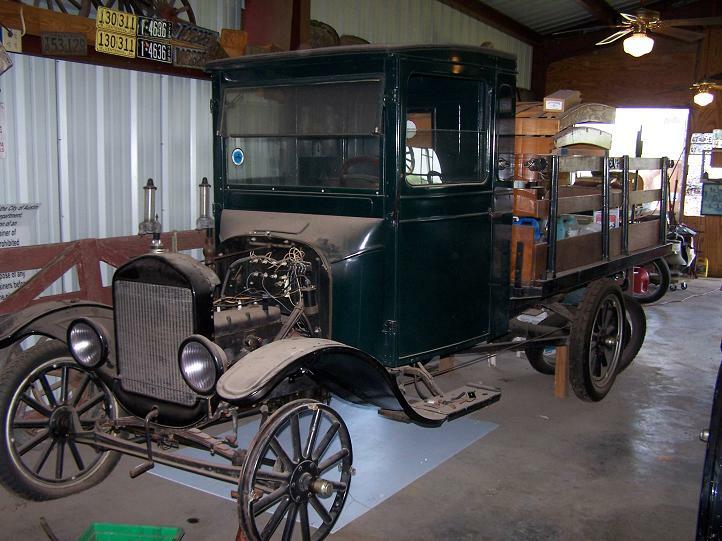 1915 Ford Model T Touring car, Tom Campbell, Castroville, TX. 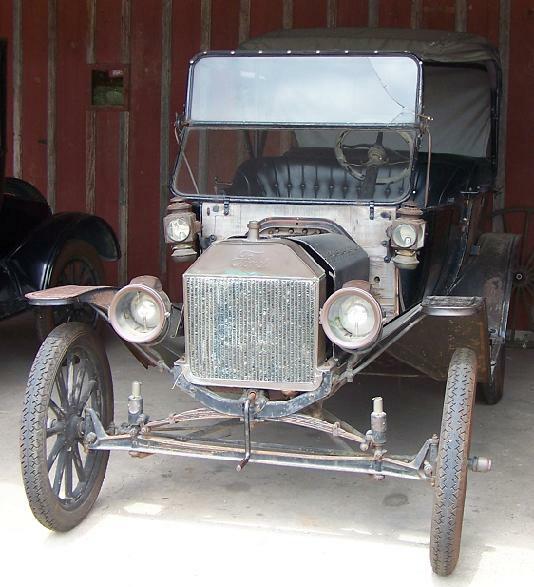 1915 Ford Model T Touring car, Jerry King, San Antonio, TX. 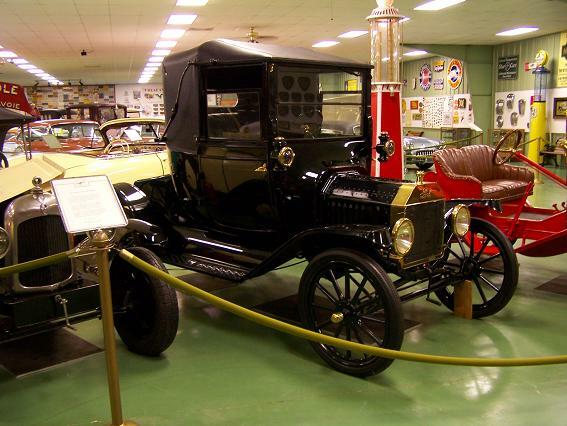 1915 Ford Model T Coupe, Witte Museum, San Antonio, TX. 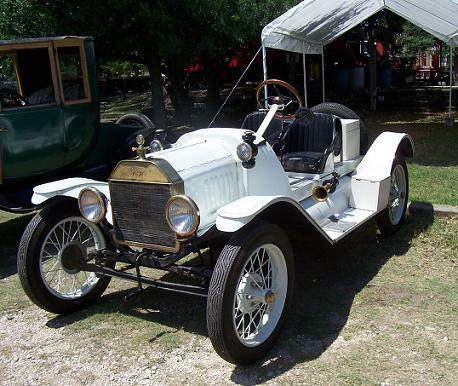 1915 Ford Model T Speedster, John Mosley, San Antonio, TX. 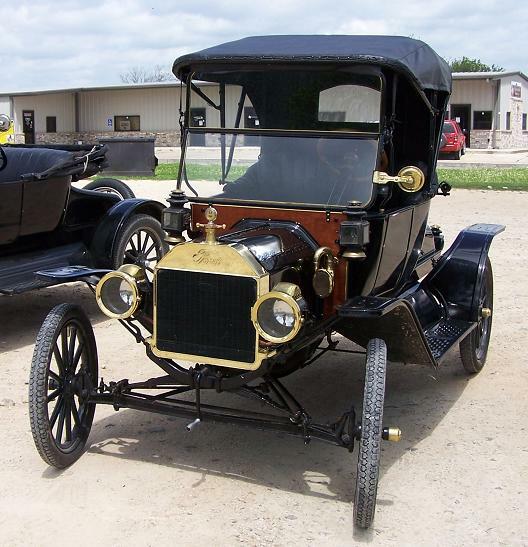 1915 Ford Model T Roadster, Wayne Johnson, San Antonio, TX. 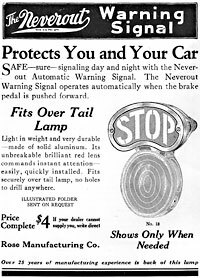 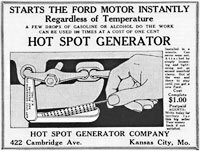 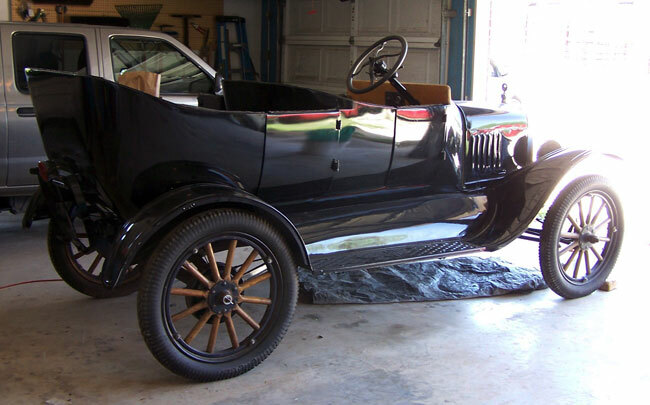 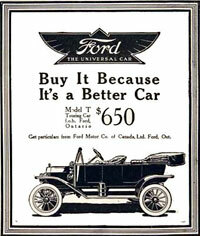 1915 Ford Model T 2 Seat Roadster, H.A. 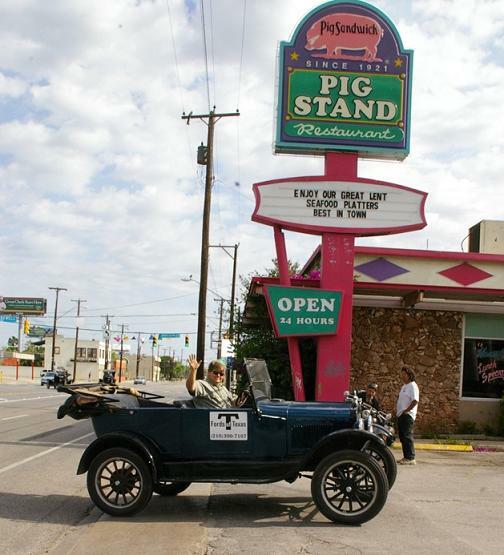 Marotta, San Antonio, TX. 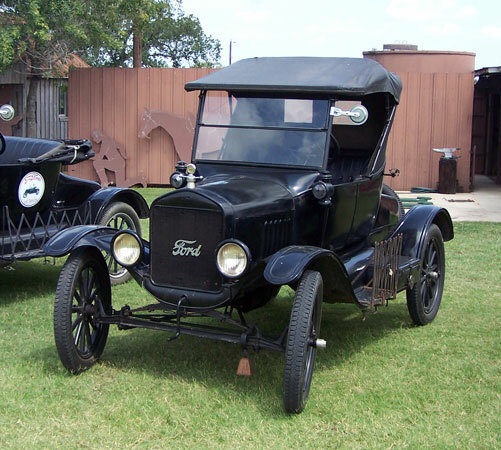 1915 Ford Model T Depot Hack, George Quintanilla, San Antonio, TX. 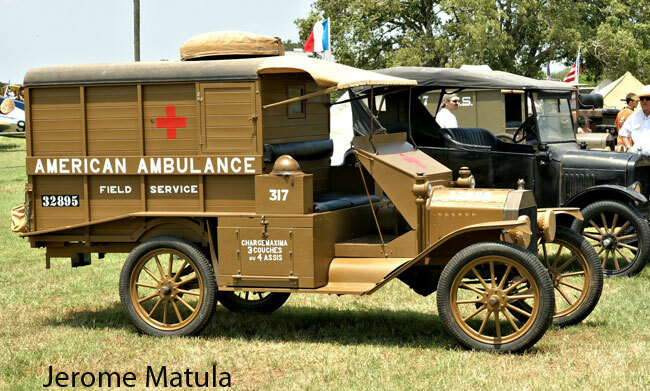 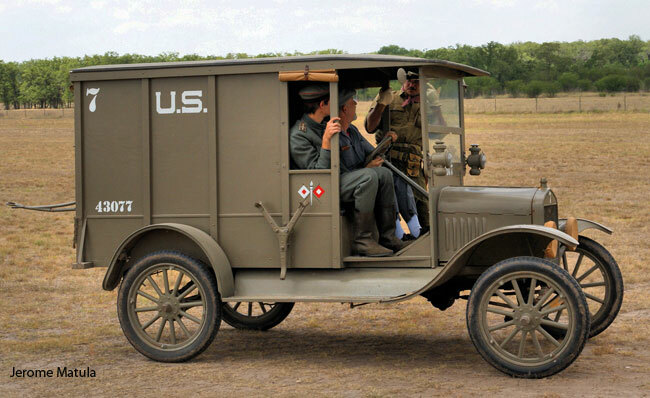 1916 Ford Model T Ambulance, Fort Sam AMMED Museum, San Antonio, TX. 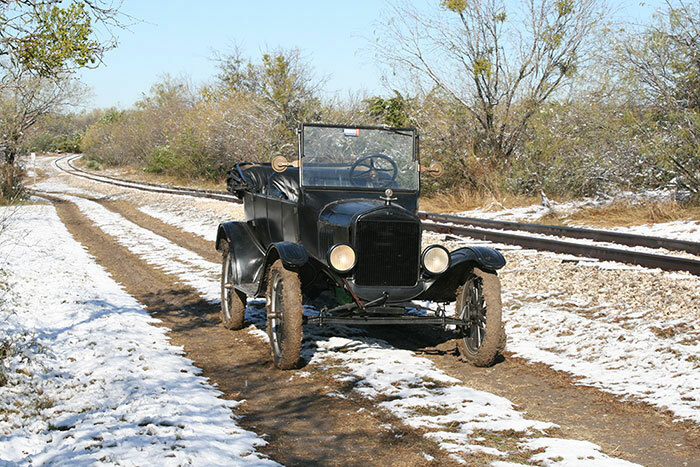 1917 Ford Model T Touring car, Richard Hansen, Converse, TX. 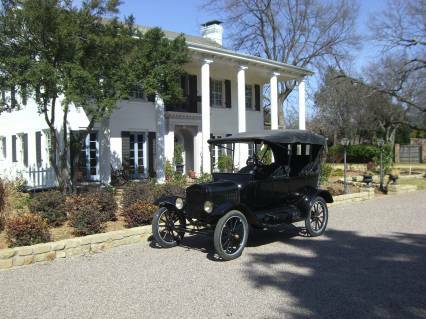 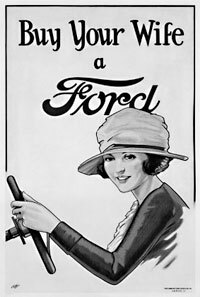 1917 Ford Model T Touring car, Laura Bitterly, San Antonio, TX. 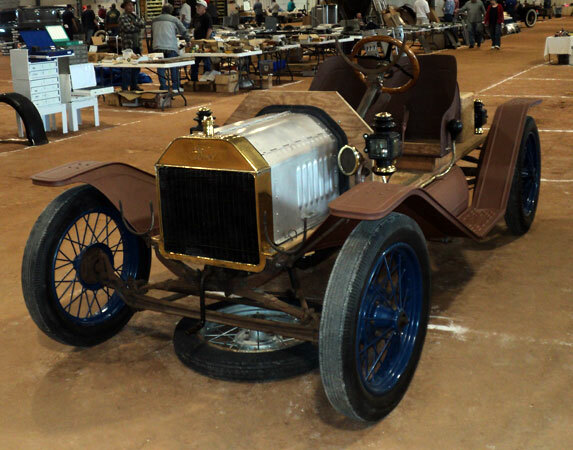 1917 Ford Model T Dirt Track Racer, Bob Dale, San Antonio, TX. 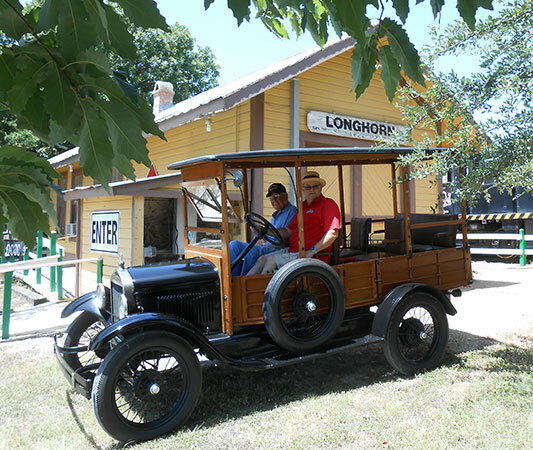 1917 Ford Model T depot hack, Don Lougheed, Buda, TX. 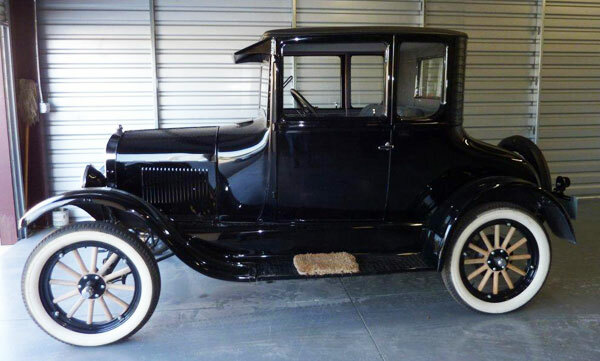 1917 Ford Model Center Door Sedan, Daniel Snell, San Antonio, TX. 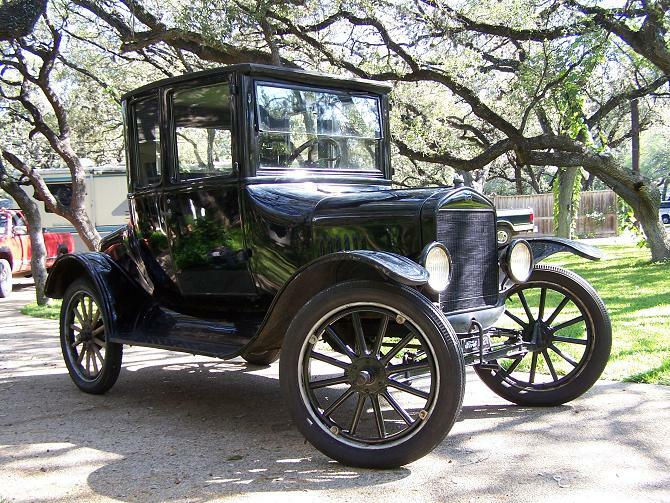 1917 Ford Model T Touring car, Richard Villanueva, San Antonio, TX. 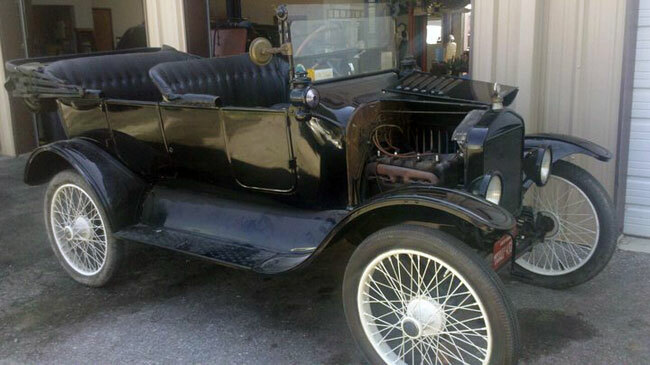 1917 Ford Model T roadster, Bob Abbey, San Antonio, TX. 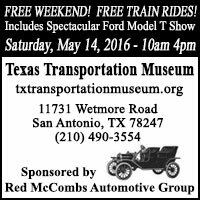 1917 Ford Model T Touring car, Tom Warner, San Antonio, TX. 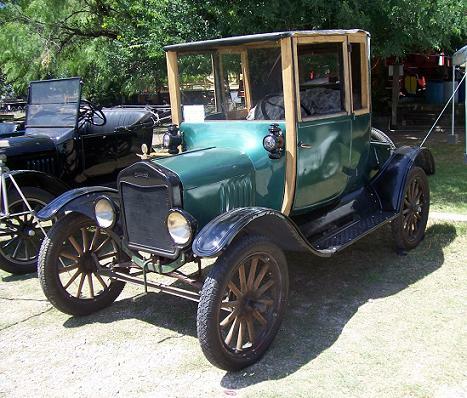 1917 Ford Model T Touring car, Bill Smith, San Antonio, TX. 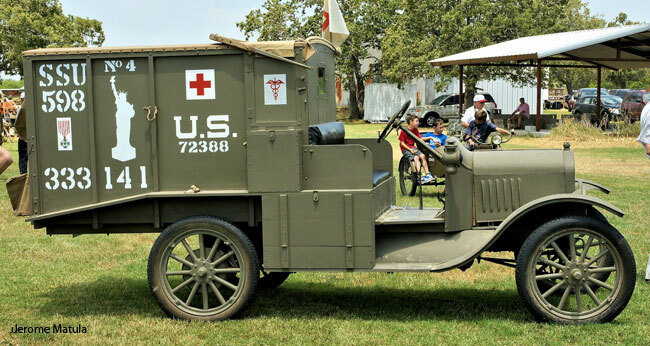 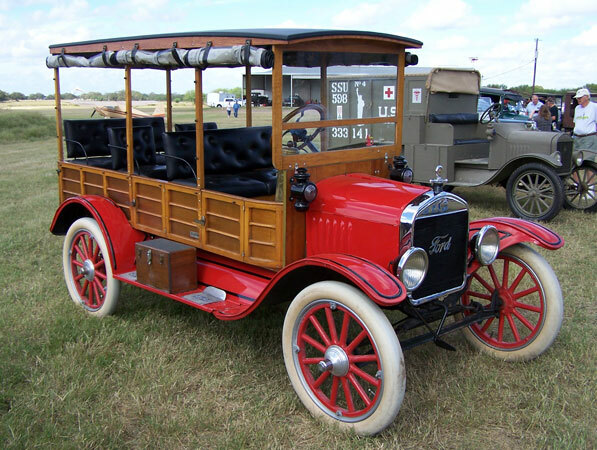 1918 Ford Model T Ambulance, Kingsbury Aerodrome, Kinsbury TX. 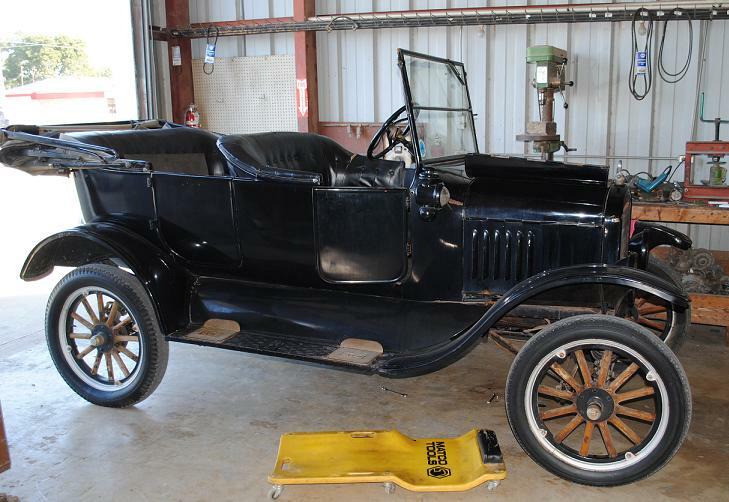 1919 Ford Model T Roadster/Pickup, Wayne McBryde, Devine, TX. 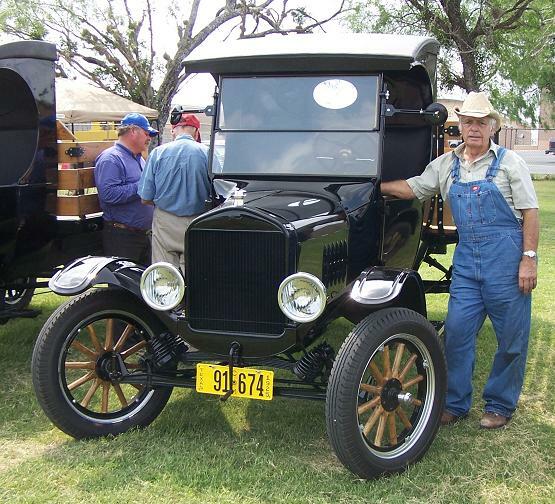 1919 Ford Model T Huckster Truck, Butch Shoemaker, Natalia, TX. 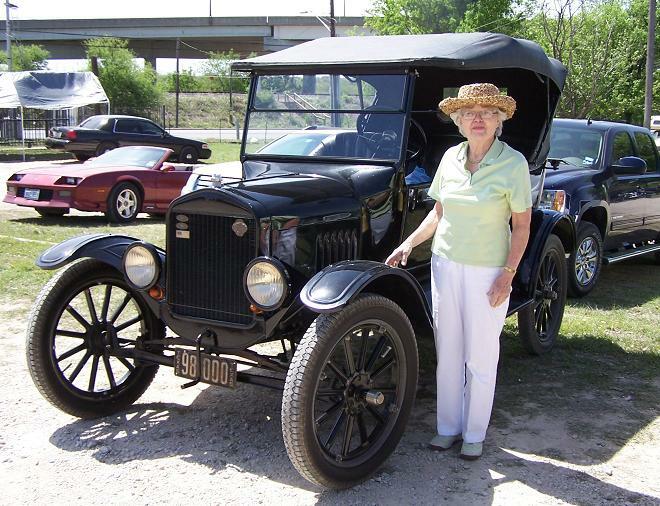 1919 Ford Model T Touring car, Deanna Roetter, San Antonio, TX. 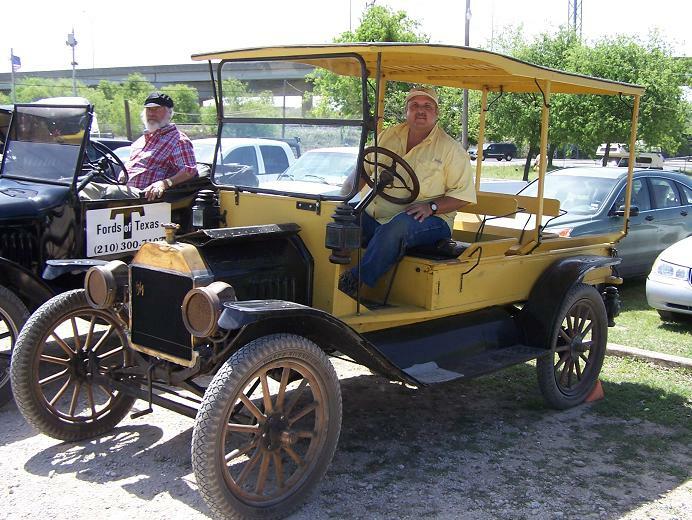 1919 Ford Model T Runabout, Buddy Young, San Antonio, TX. 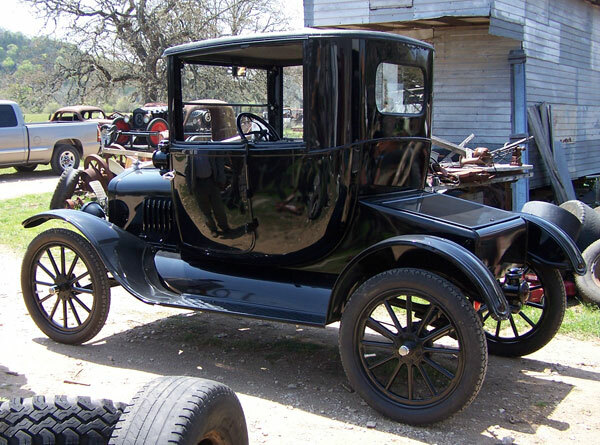 1919 Ford Model T Doctor's Coupe, Shelby Koehler, Floresville, TX. 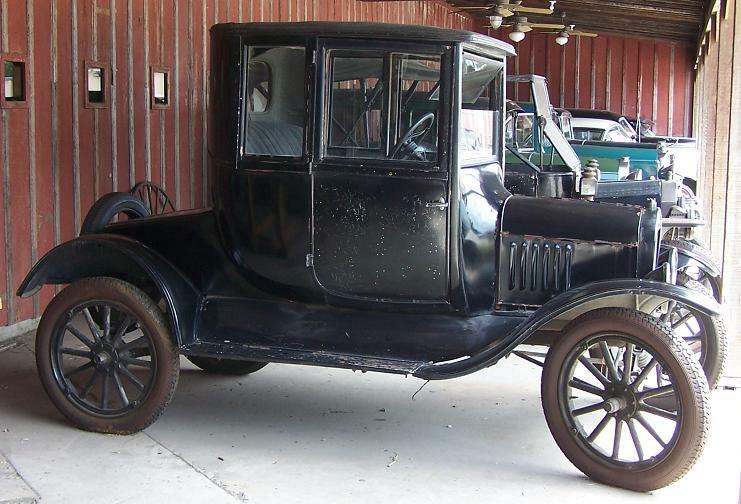 1919 Ford Model T Center Door, Sonny House, Bastrop, TX. 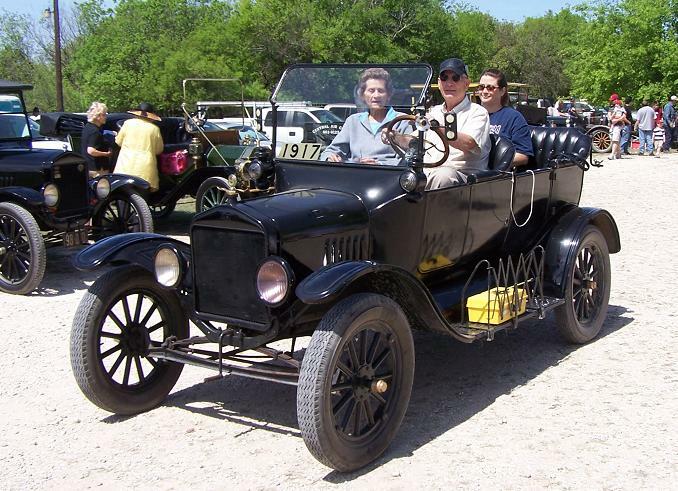 1920 Ford Model T 2 Seat Speedster, Stephen Mazurek, San Antonio, TX. 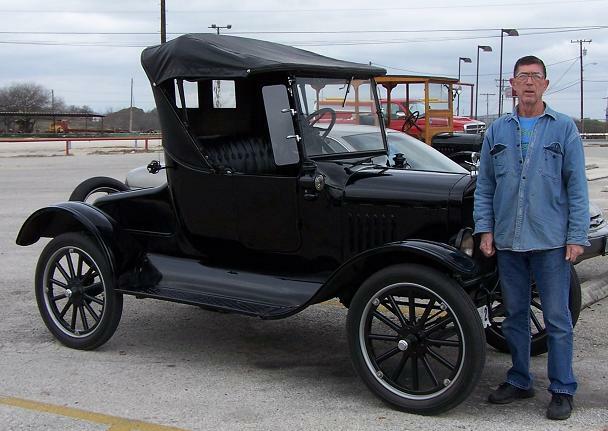 1920 Ford Model T Doctor's Coupe, Daniel Bratcher, Schertz, TX. 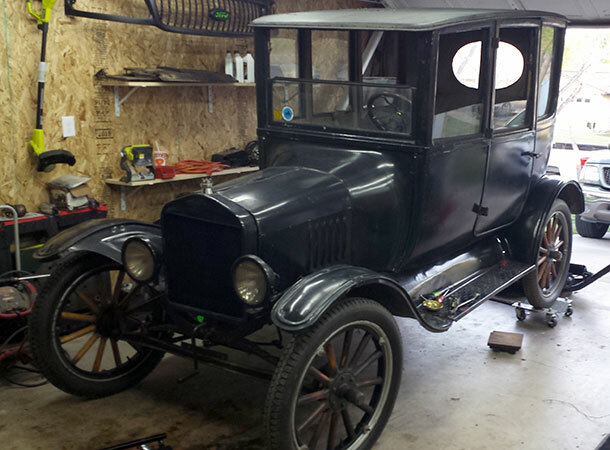 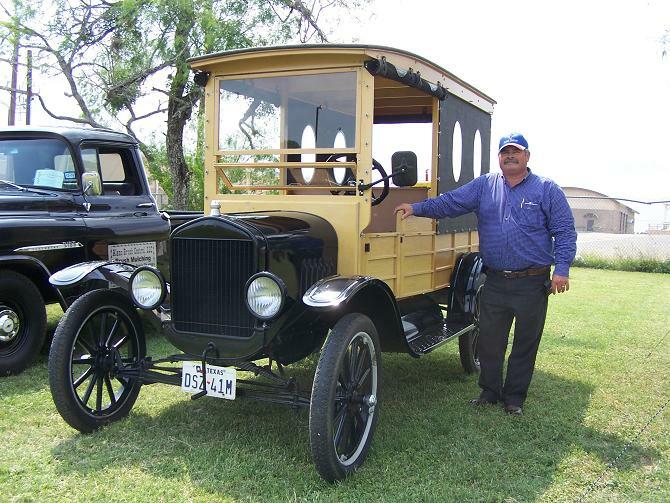 1920 Ford Model T Depot Hack, Steve Campa, Floresville, TX. 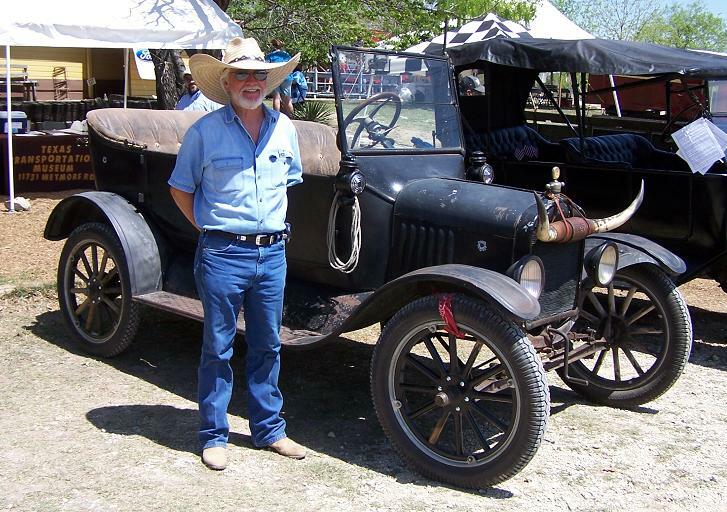 1920 Ford Model T Speedster, Steve Campa, Floresville, TX. 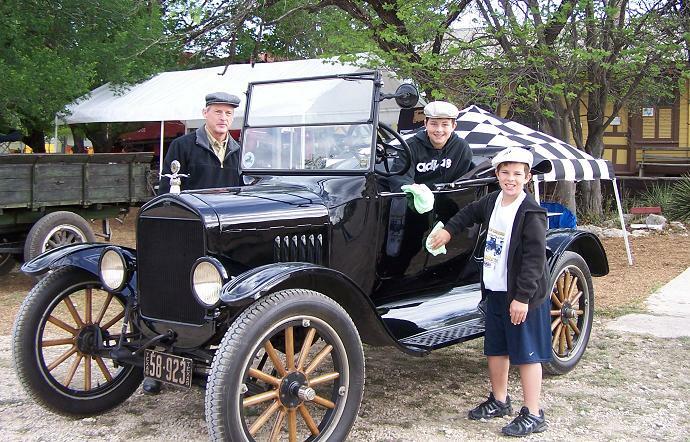 1920 Austalian Ford Model Touring Car, Anton Hajek, San Antonio, TX. 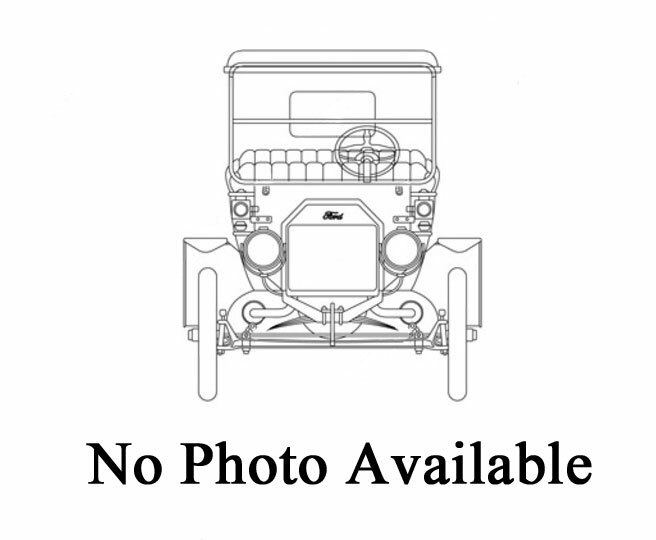 1920 Ford Model T Center Door, Beverly Luce, San Antonio, TX. 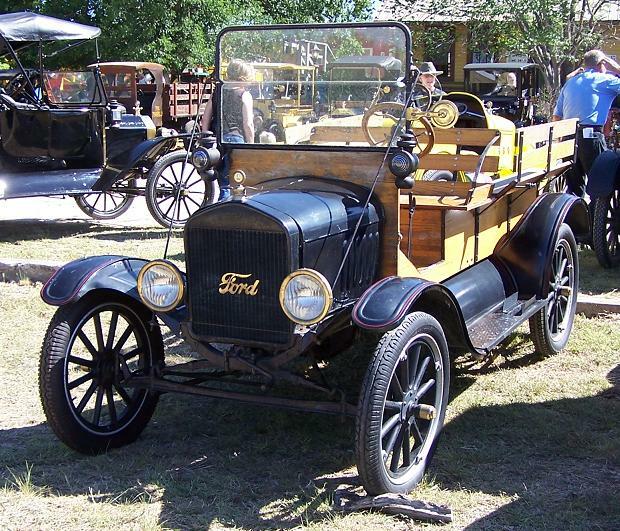 1920 Ford Model T Touring car, Don Weaver, San Antonio, TX. 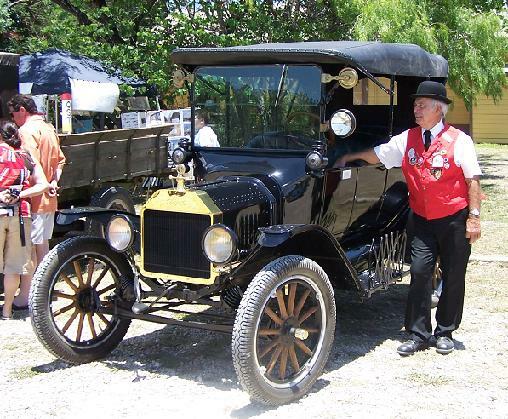 1920 Ford Model T runabout, Craig Noyes, San Antonio, TX. 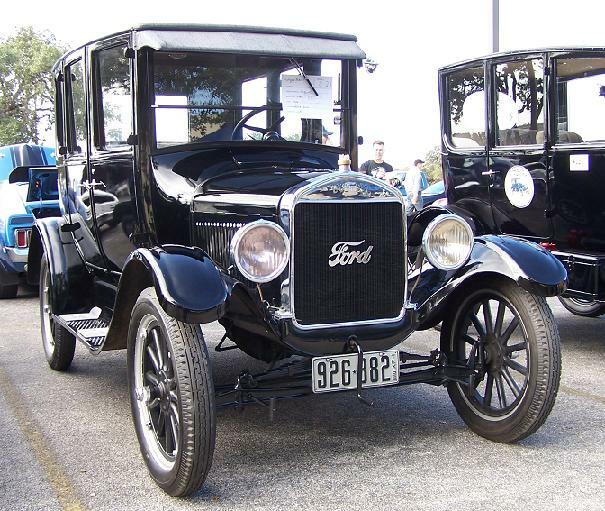 1921 Ford Model T Center Door, George Wilson, San Antonio, TX. 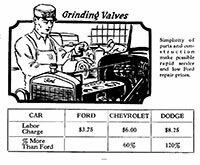 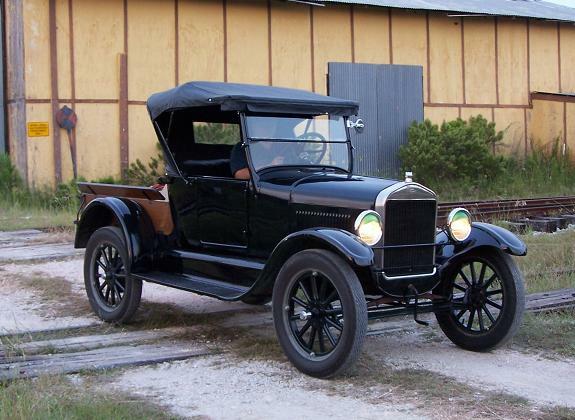 1921 Ford Model T Doctor's Coupe, SAS Shoe Factory, San Antonio, TX. 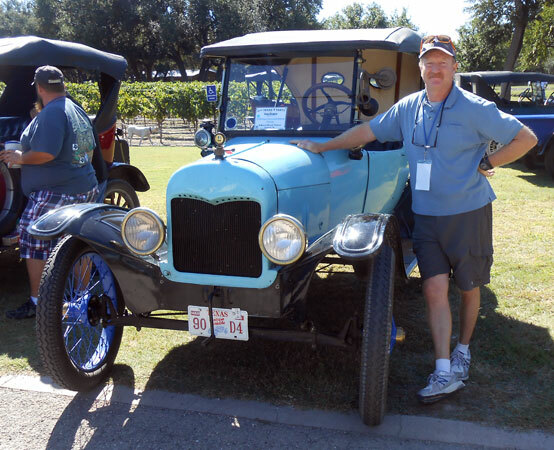 1921 Ford Model T Doctor's Coupe, Keith Nilsson, San Antonio, TX. 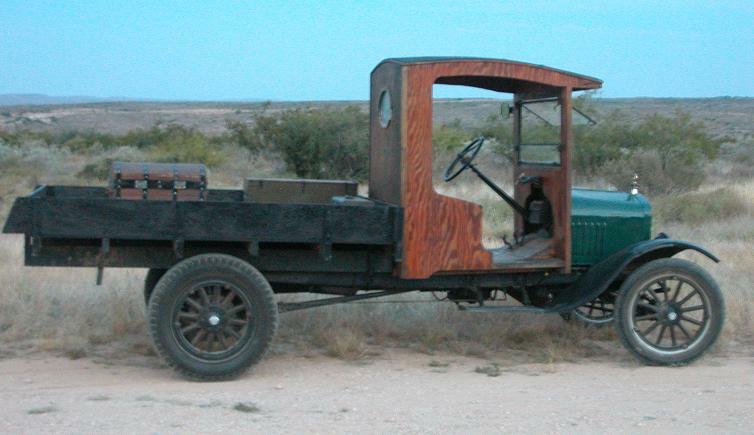 1921 Ford Model T Depot Hack, Marshall Huling, San Angelo, TX. 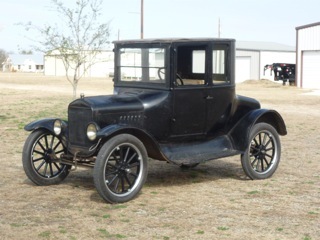 1921 Ford Model T touring car, Marshall Huling, San Angelo, TX. 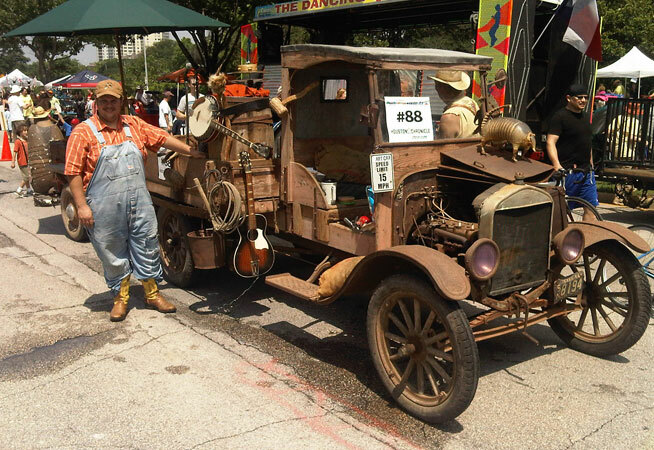 1921 Ford Model T touring car, Marc Bayonna, San Antonio, TX. 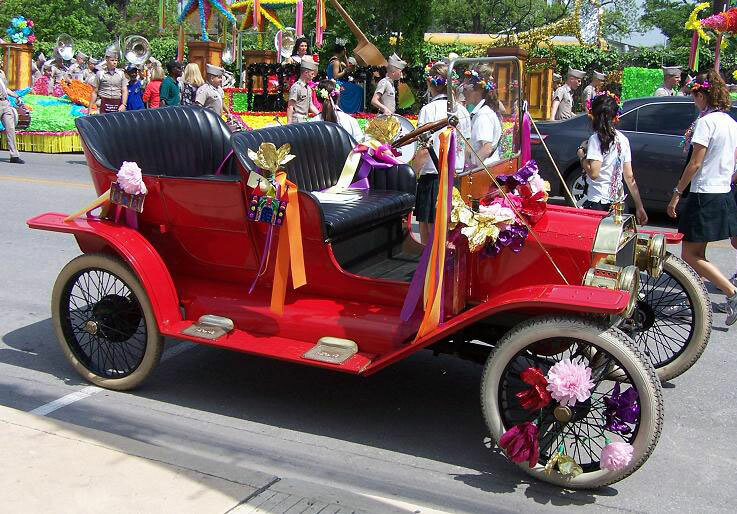 1921 Ford Model T Center Door, Lauren Mackechney, San Antonio, TX. 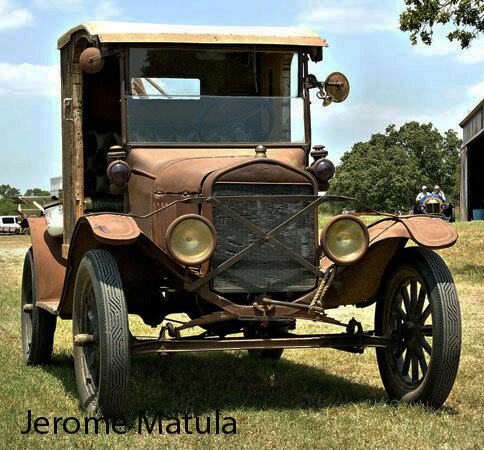 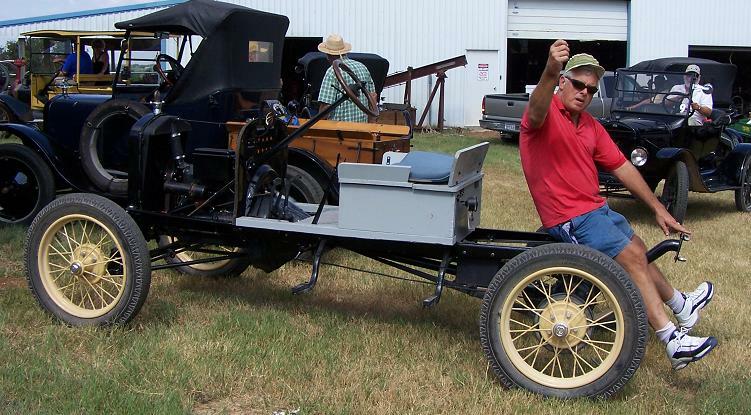 1921 Ford Model T Touring car, James Deatherage, Seguin, TX. 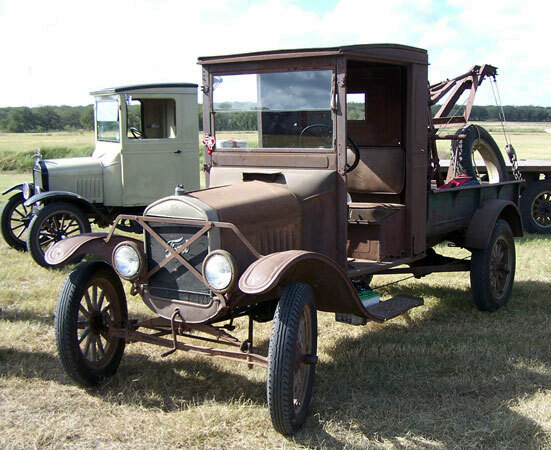 1921 Ford Model TT Truck, James Deatherrage, Seguin, TX. 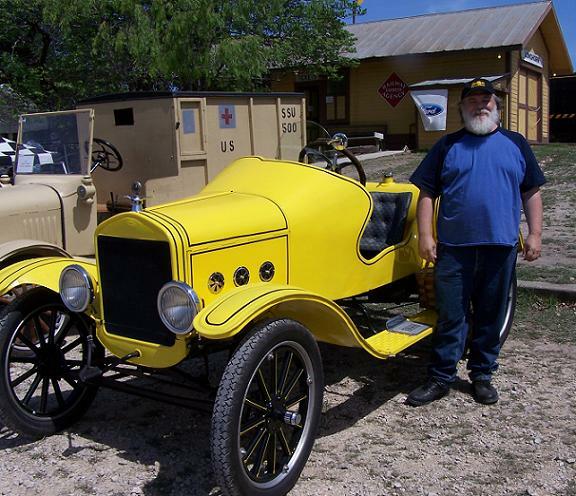 1922 Ford Model T Touring car, Yellow Taxi / George Alva, San Antonio, TX. 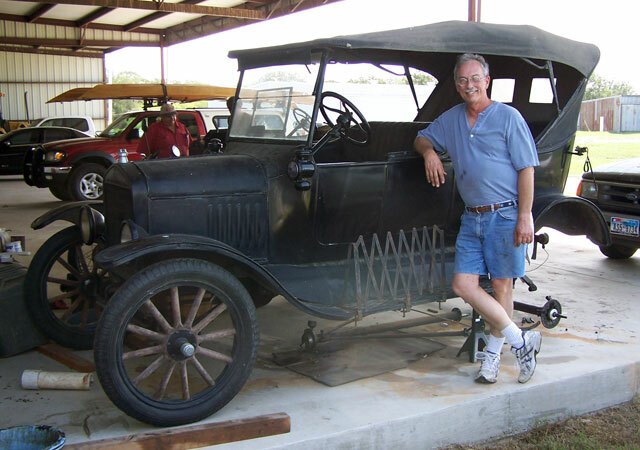 1922 Ford Model T Depot Hack, Fred Pierdolla, La Vernia, TX. 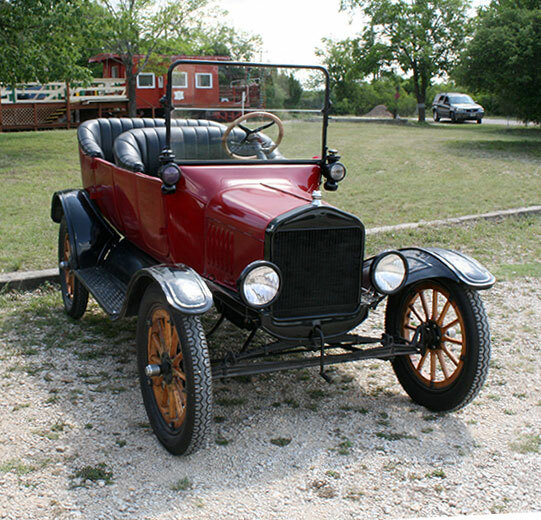 1922 Ford Model T 2-Seat Runabout, Darrell Vanderford, Georgetown, TX. 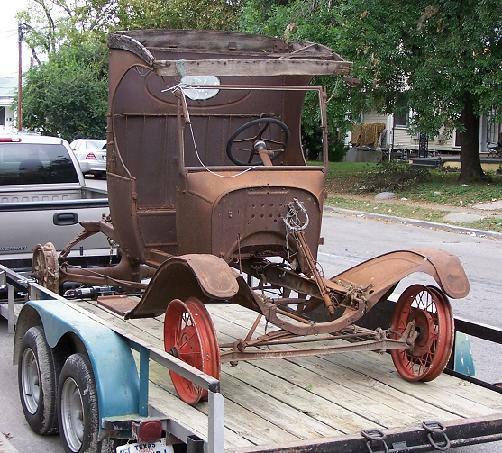 1922 Ford Model T Huckster Truck, Homer Holland, San Antonio, TX. 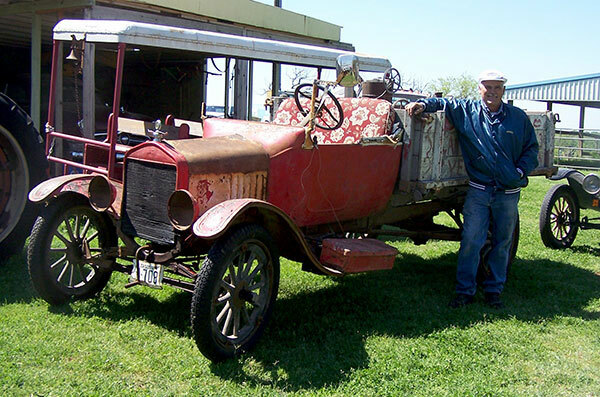 1922 Ford Model T Touring Car, Bruce Robertson, Killeen, TX. 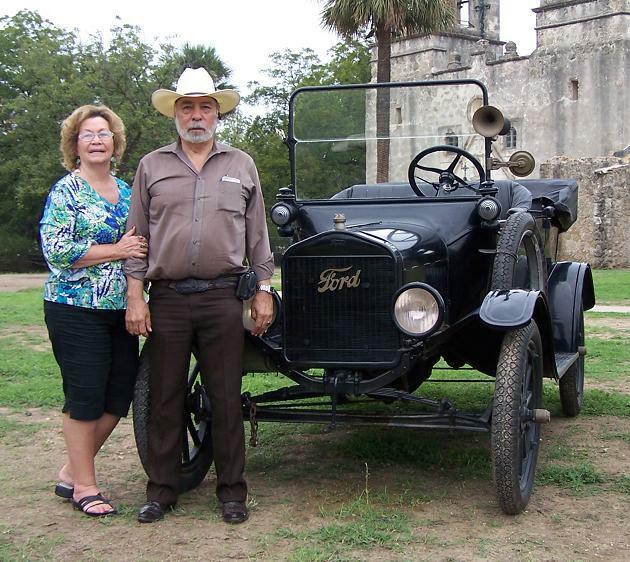 1922 Ford Model T Touring Car, Bruce & Annette Hernandez, San Antonio, TX. 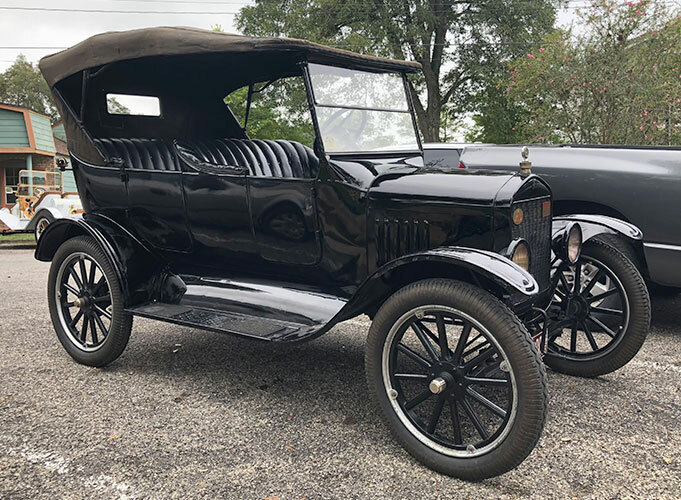 1922 Ford Model T Coupe, Tama Oringdorff, Schertz, TX. 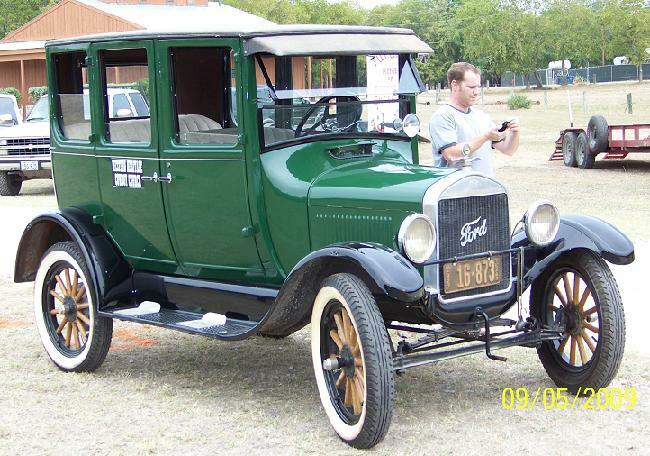 1922 Ford Model T 4-Door, Shelby Koehler, Floresville, TX. 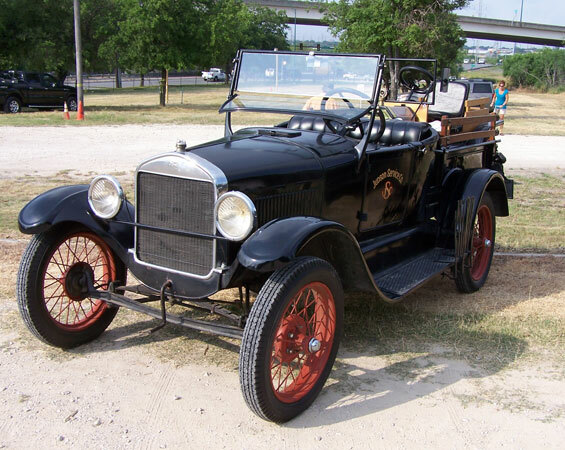 1923 Ford Model T 2-Seat Roadster, Richard Villanueva, San Antonio, TX. 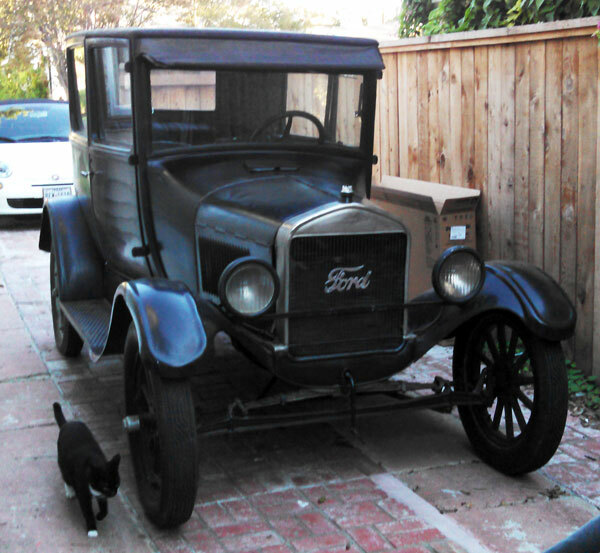 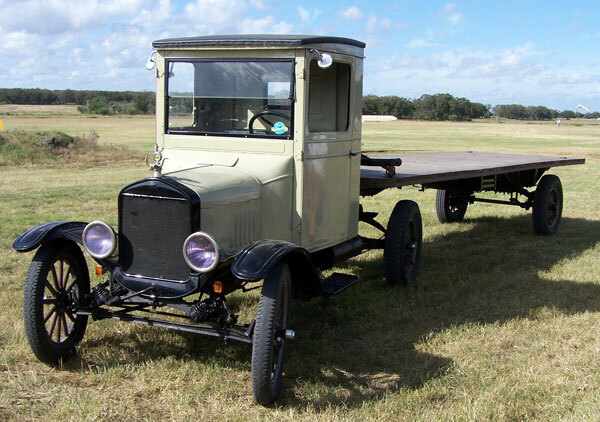 1923 Ford Model T Farm Pickup, Donald Weaver, San Antonio, TX. 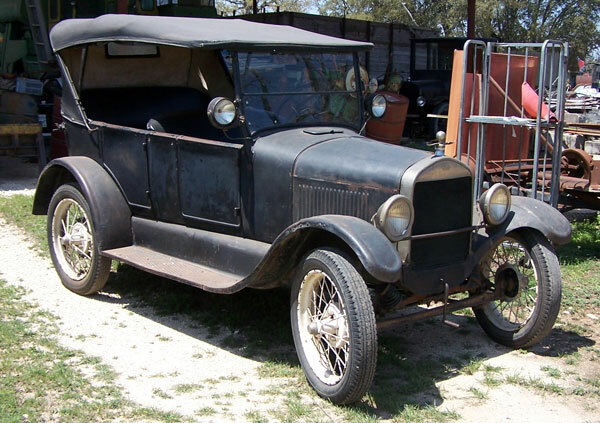 1923 Ford Model T Doctor's Coupe, Donald Weaver, San Antonio, TX. 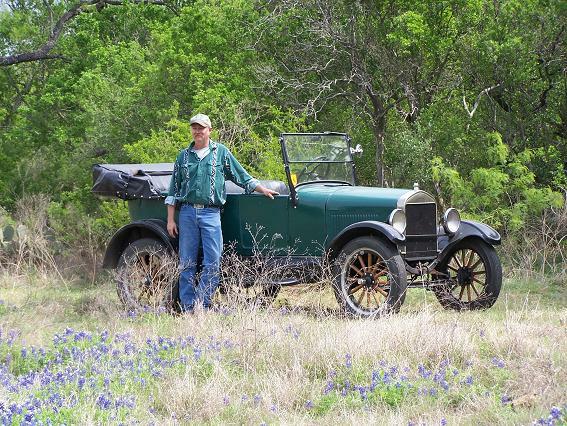 1923 Ford Model T Touring car, Neil Middleton, Lake Hills, TX. 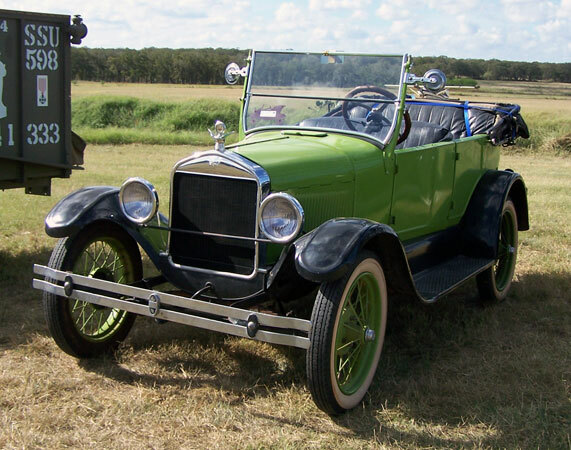 1923 Ford Model T 2-Seat Roadster, Marshall Huling, San Angelo, TX. 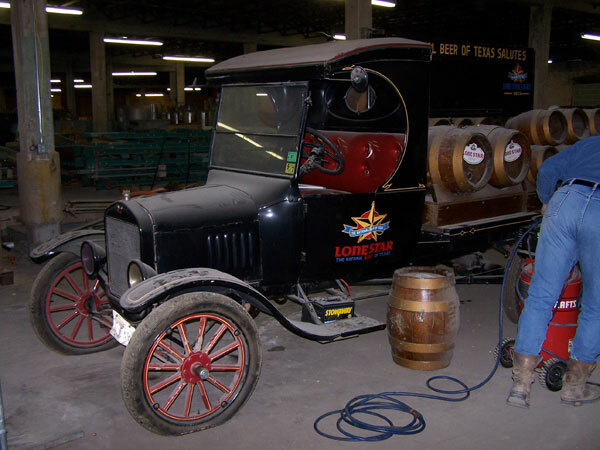 1923 Ford Model T Tanker Truck, Anthony Mackechney, San Antonio, TX. 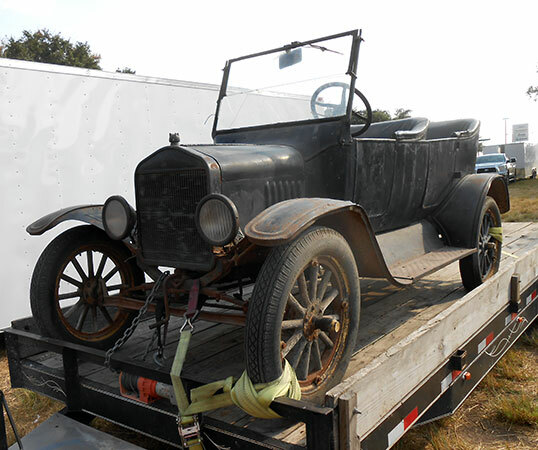 1923 Ford Model T Roadster / Pickup, Clint Bitterly, San Antonio, TX. 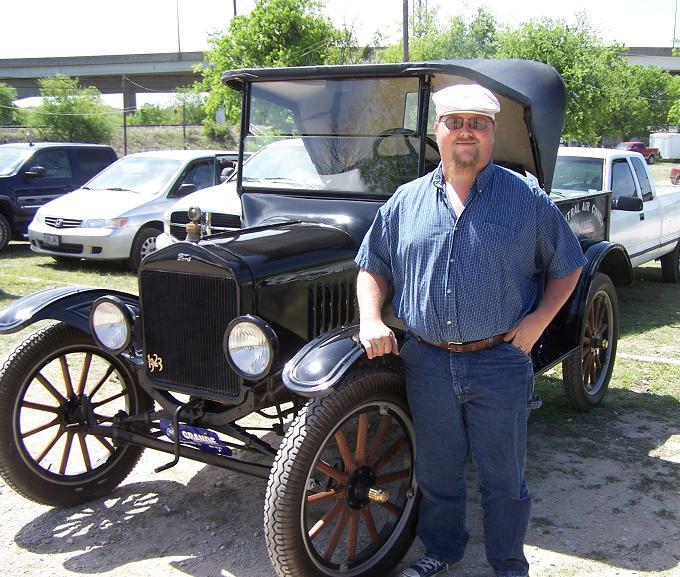 1923 Ford Model T 2-Seat Roadster, Gary Bethke, San Antonio, TX. 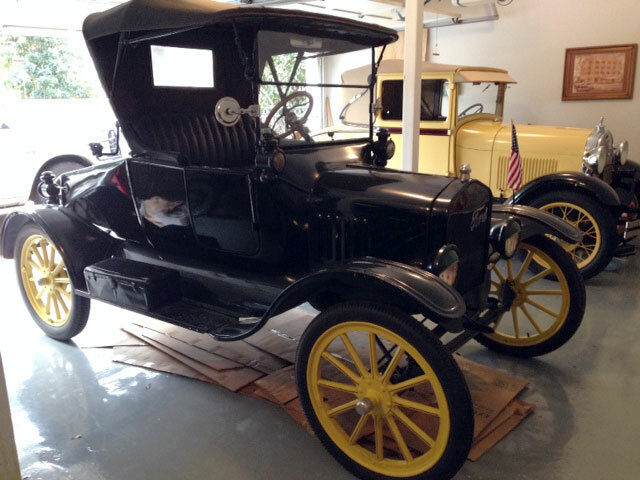 1923 Ford Model T Touring car, Ken Stevens, Boerne, TX. 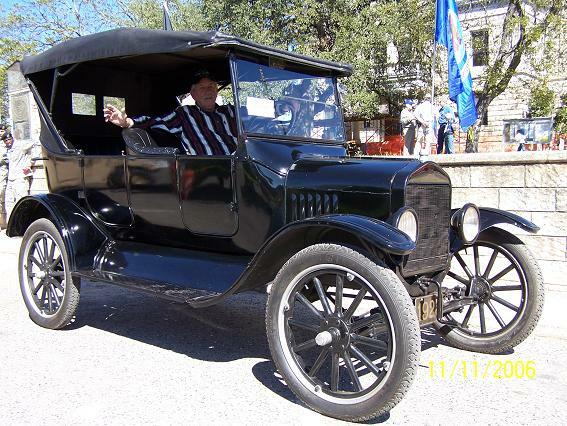 1923 Ford Model T Runabout, Richard Horvath, San Antonio, TX. 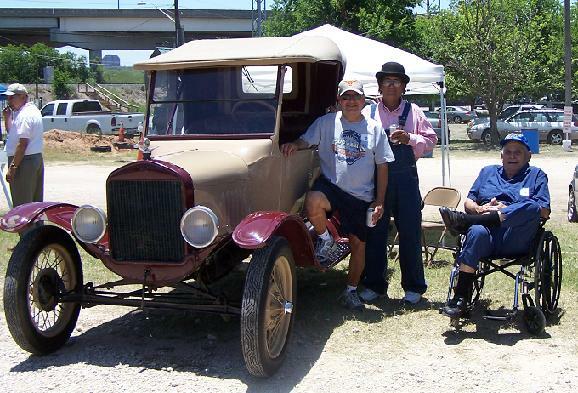 1923 Ford Model T Runabout, Gearld and Brandon Borchers, San Antonio, TX. 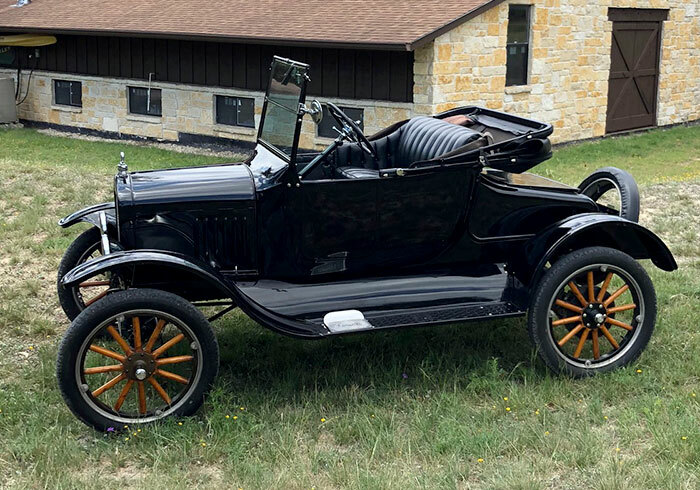 1923 Ford Model T Speedster, Marc Johnston, Helotes, TX. 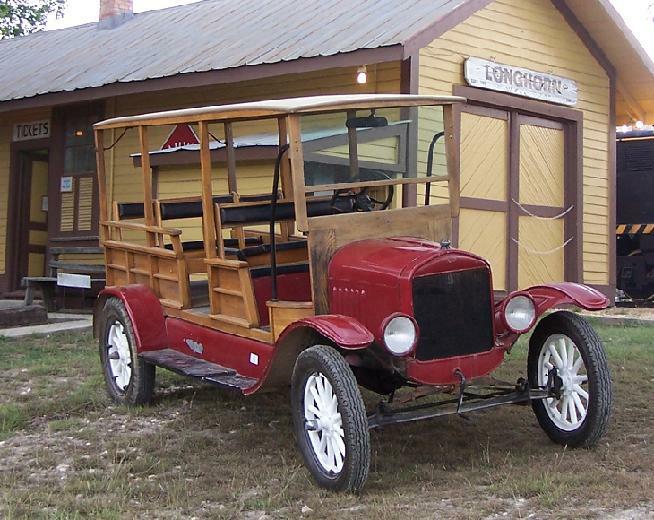 1924 Ford Model T Depot Hack, Robert Norberg, Dripping Springs, TX. 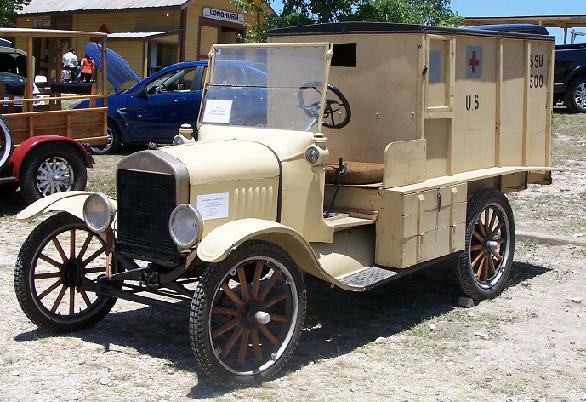 1924 Ford Model T Ambulance, Texas Air Museum, San Antonio, TX. 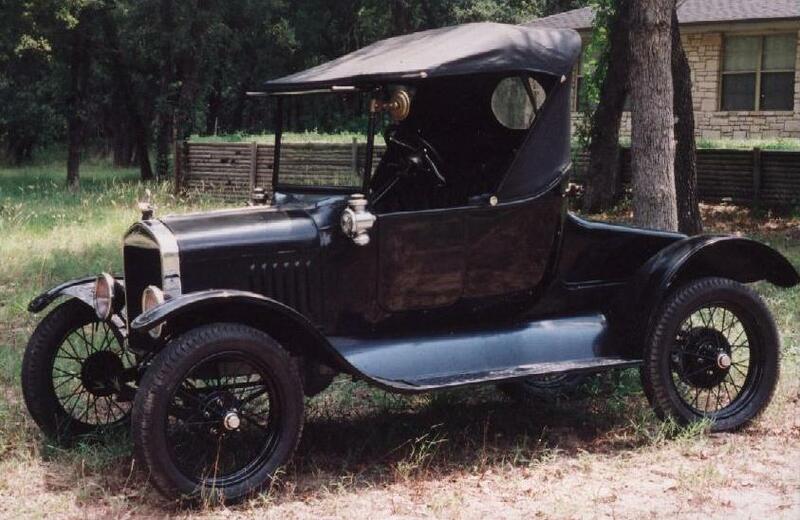 1924 Ford Model T Touring car, June Prade, San Antonio, TX. 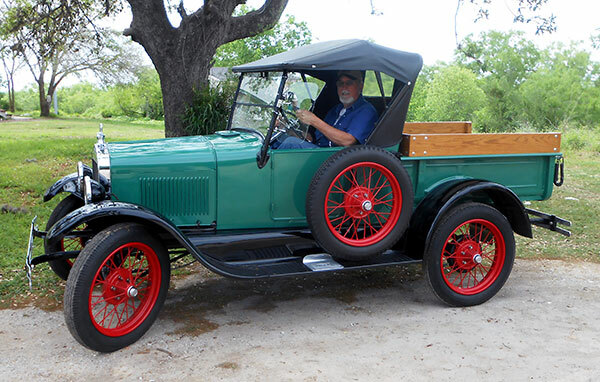 1924 Ford Model T Touring car, Phillip Cavanaugh, New Braunfels, TX. 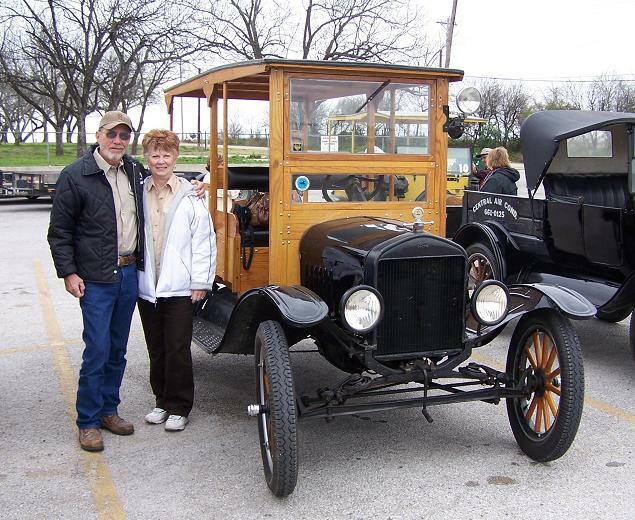 1924 Ford Model T Touring car, Darrell Vanderford, Georgetown, TX. 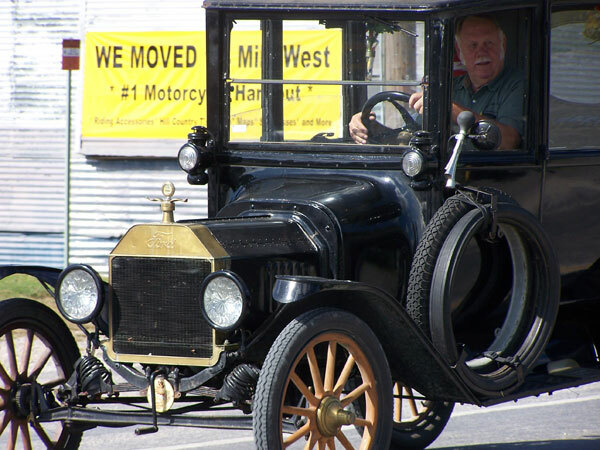 1924 Ford Model T Roadster, John Millet, San Antonio, TX. 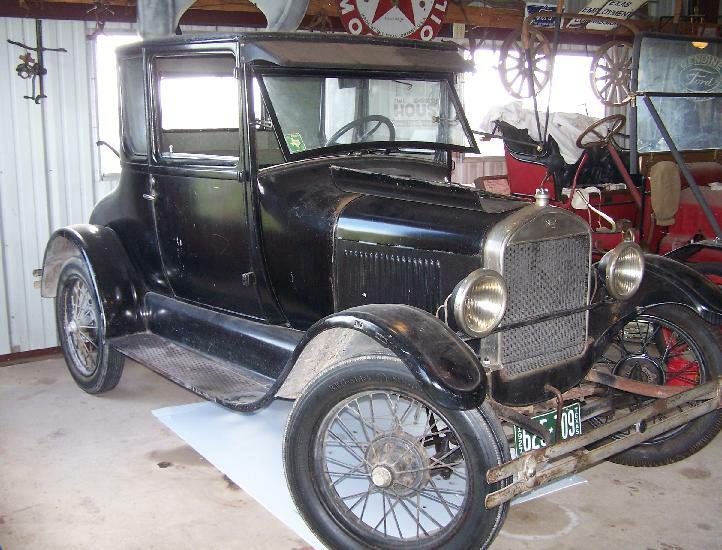 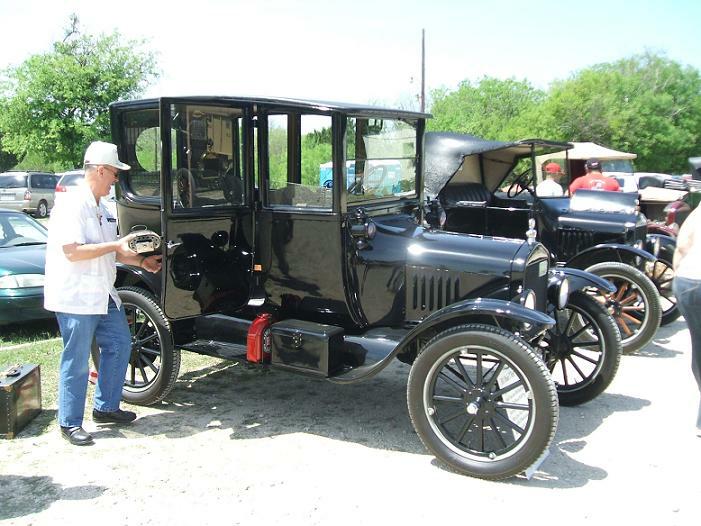 1924 Ford Model T Touring car, Bill Dillard, Uvalde, TX. 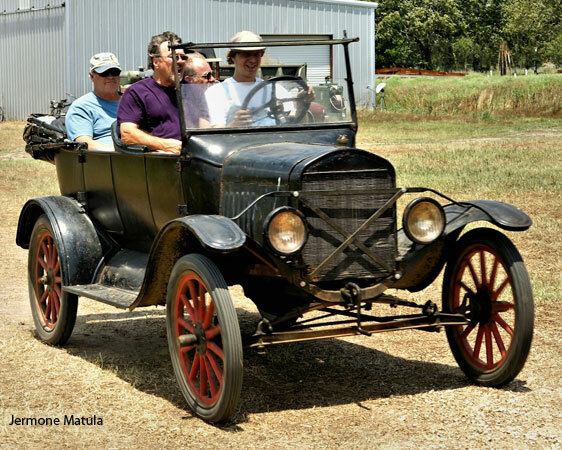 1924 Ford Model T Runabout, David Kallenberg, La Vernia, TX. 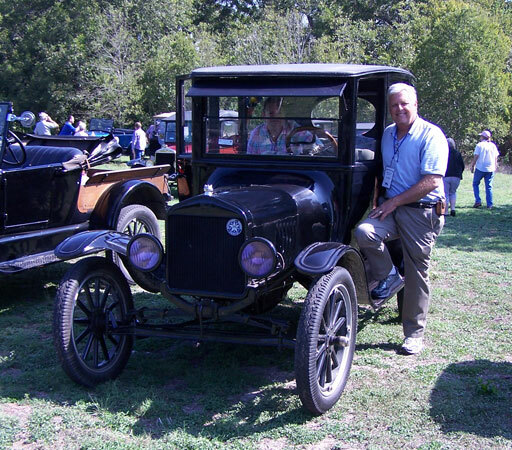 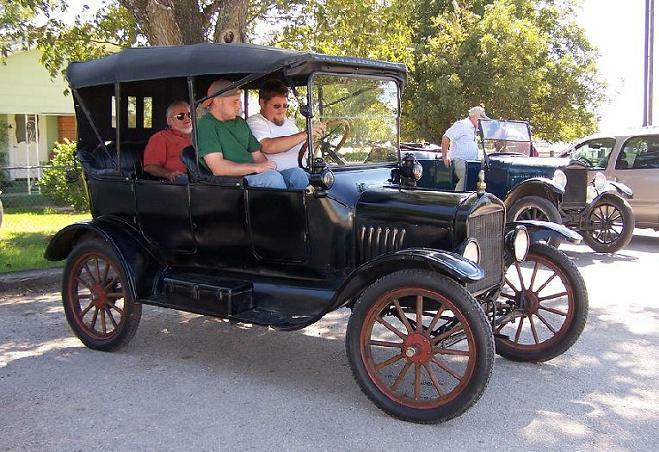 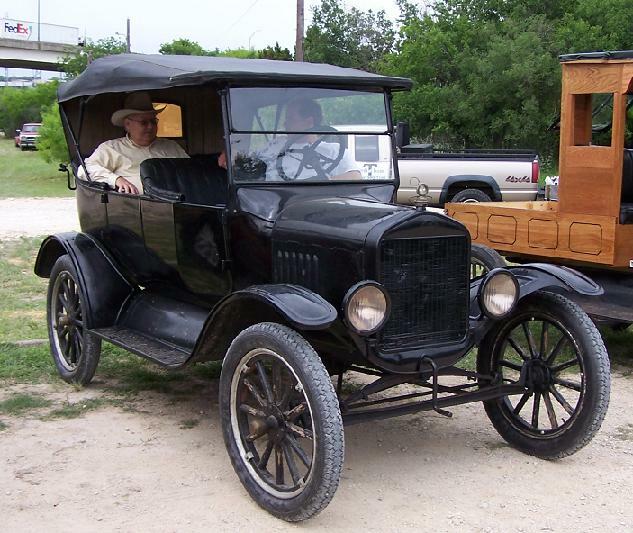 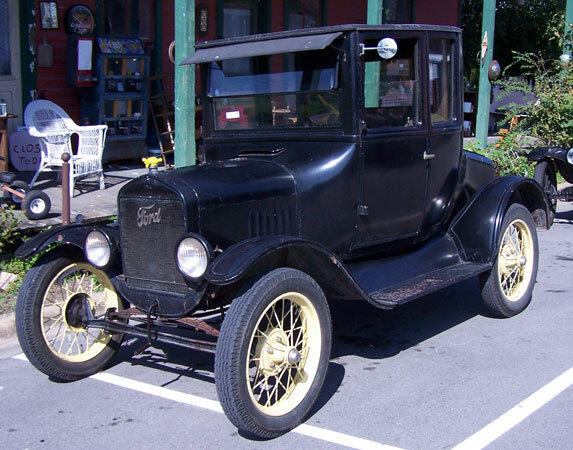 >1924 Ford Model T Runabout, Willie Cordes, Schulenburg, TX. 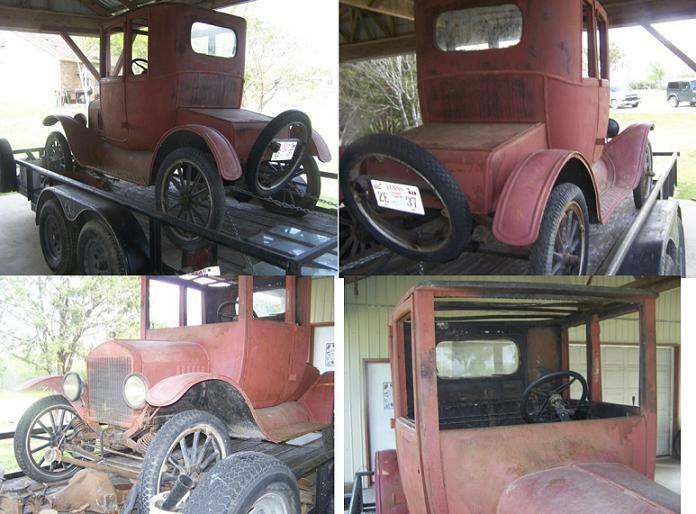 >1924 Ford Model T Doctor's Coupe, Willie Cordes, Schulenburg, TX. 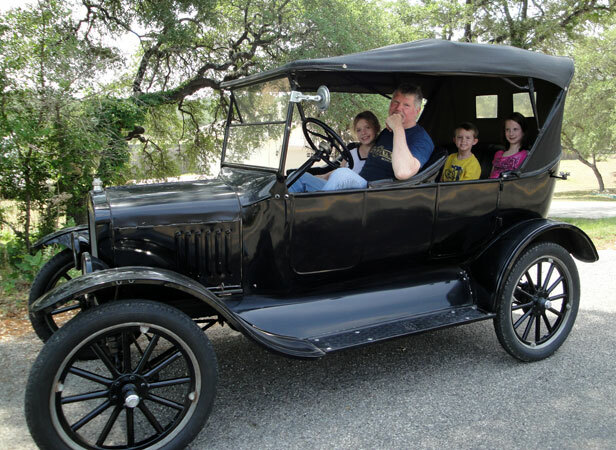 >1924 Ford Model T Touring, Cameron Whitaker, College Station, TX. 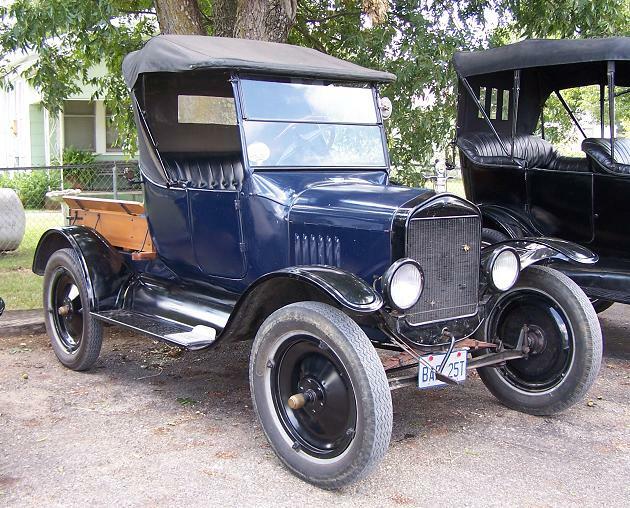 1924 Ford Model T touring car, Daniel Snell, San Antonio, TX. 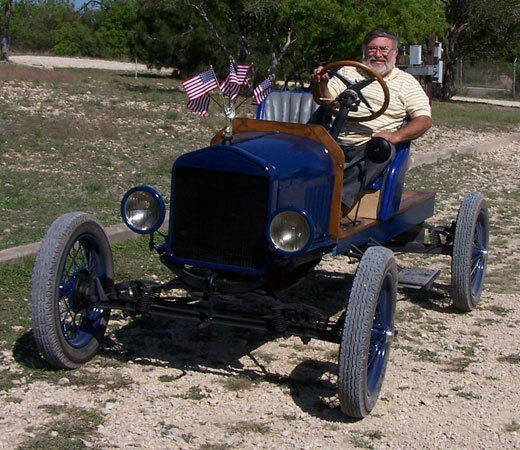 >1924 Ford Model T Runabout, Tom Venditti, Kerrville, TX. 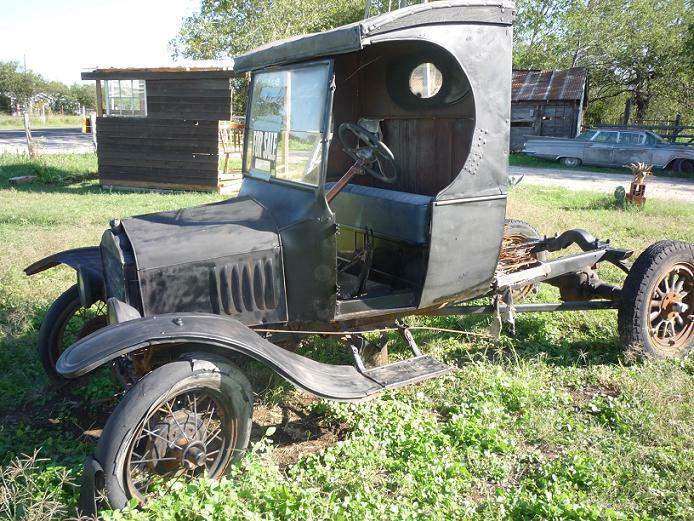 1924 Ford Model T Depot Hack, John Stuart, Boerne, TX. 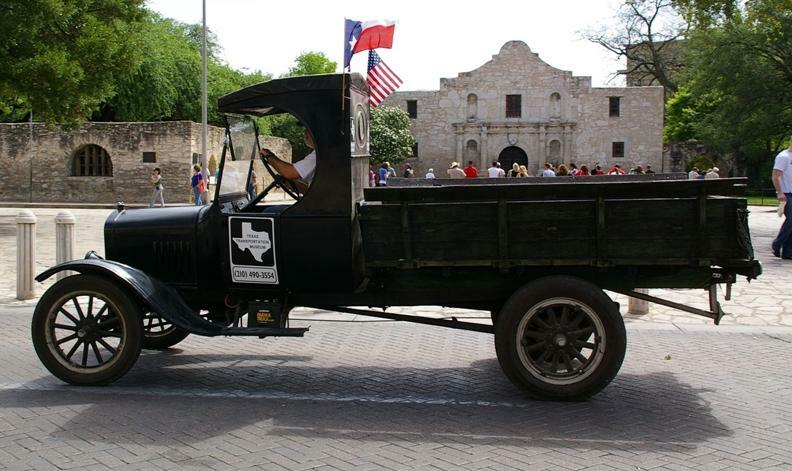 1924 Ford Model T Touring car, Louis Miorelli, San Antonio, TX. 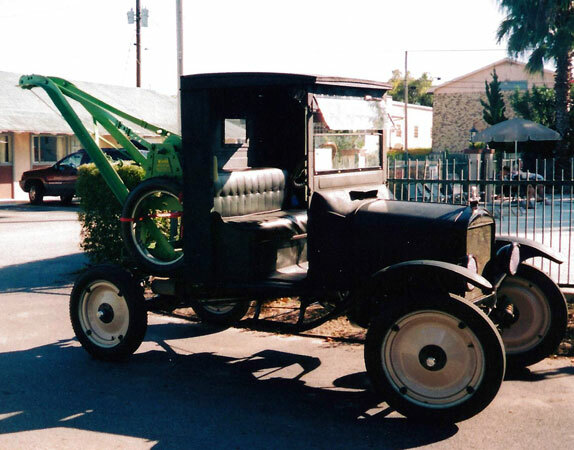 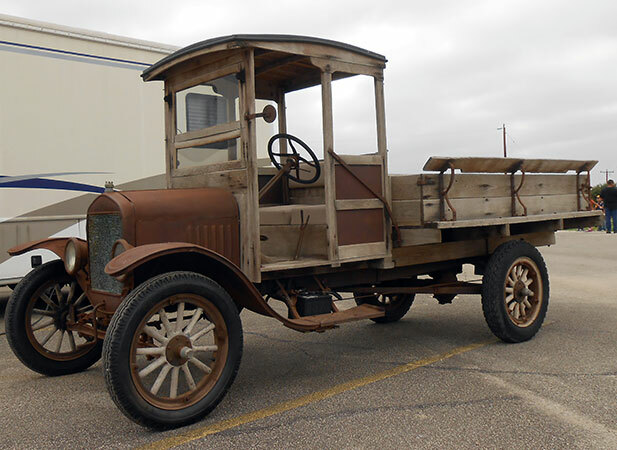 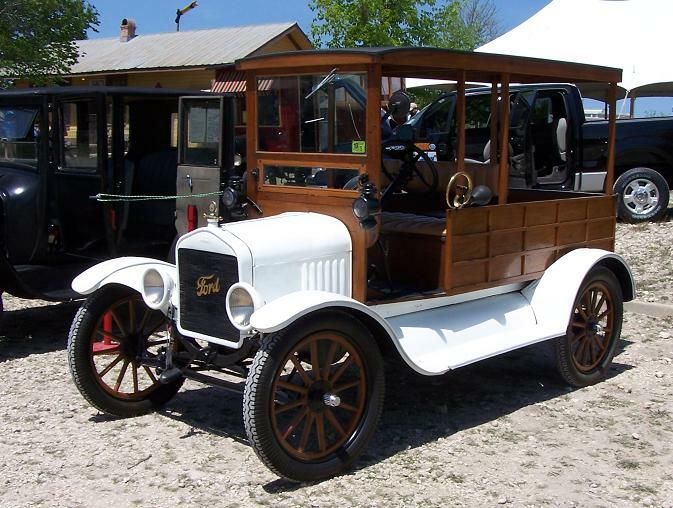 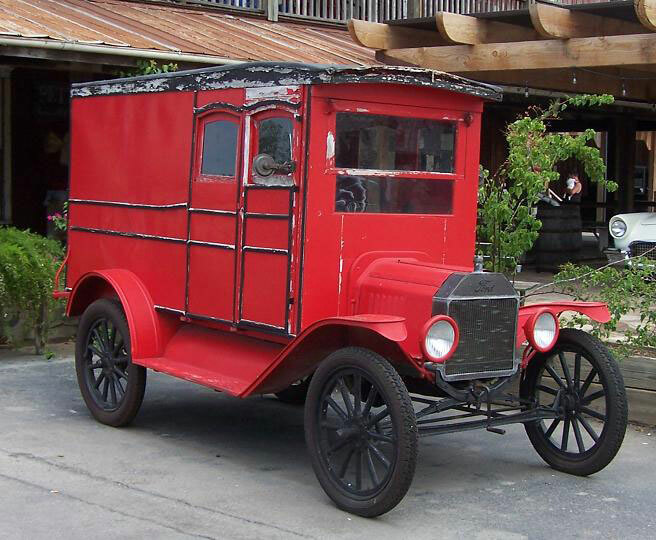 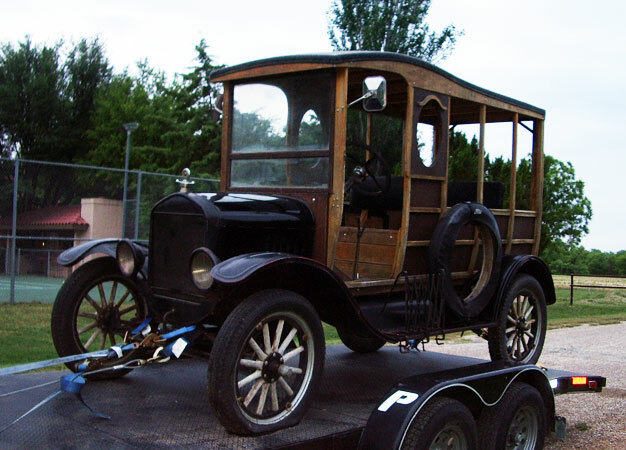 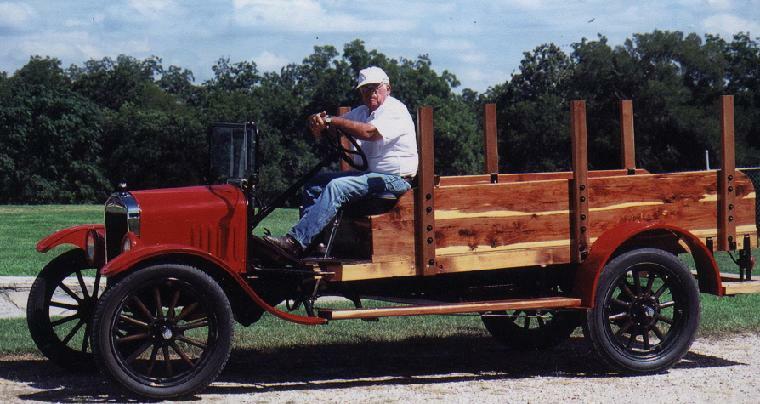 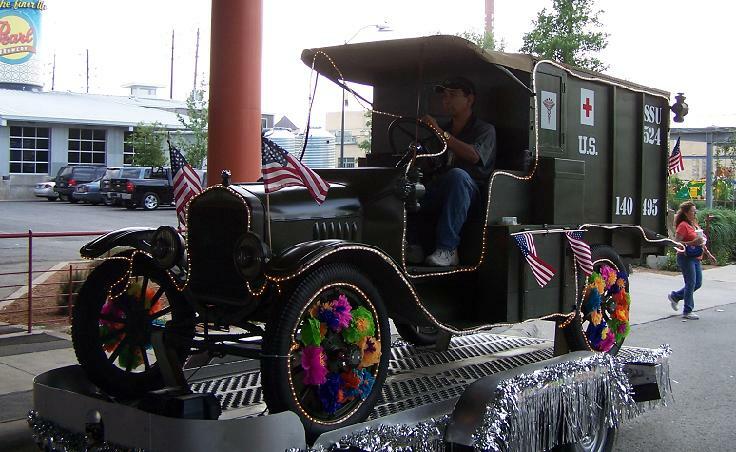 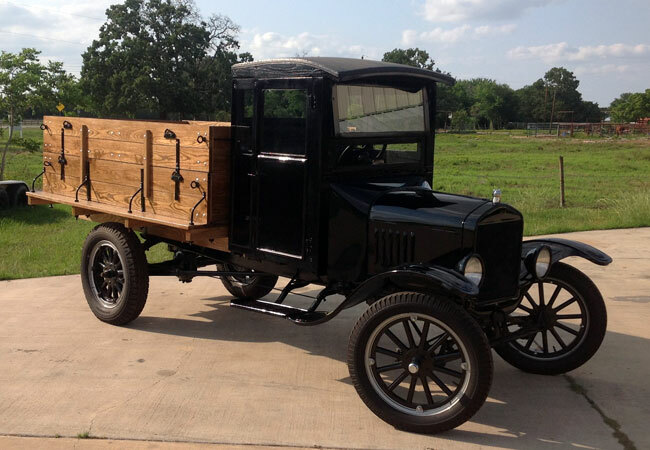 1924 Ford Model T Stake Bed Truck, Jim Keeter, Boerne, TX. 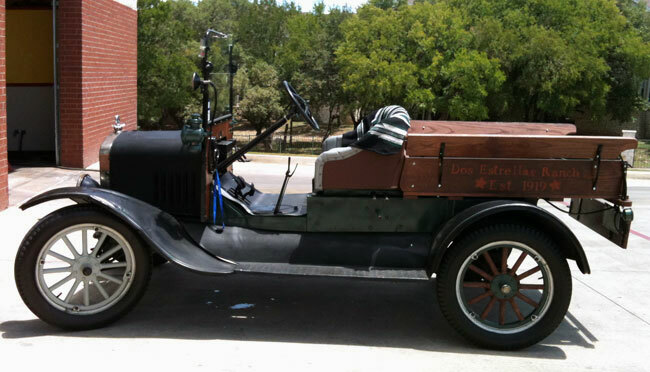 1924 Ford Model T Touring car, John Jones, Boerne, TX. 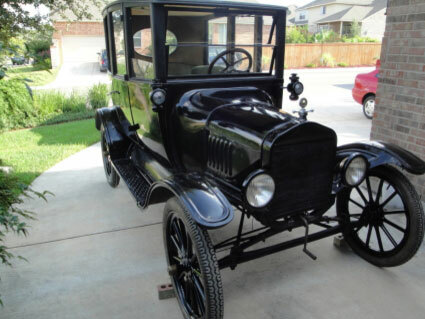 1924 Ford Model T Fordor, Baylor Randle, San Antonio, TX. 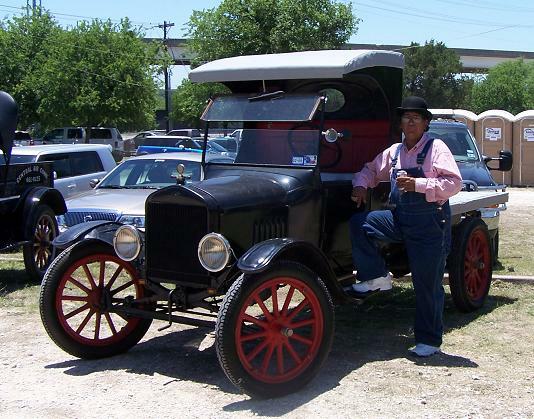 1924 Ford Model T Touring car, Henry Tijerina, San Antonio, TX. 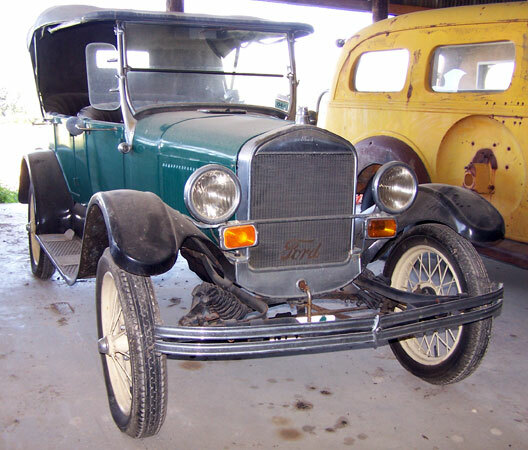 1925 Ford Model T Doctor's Coupe, Marshall Huling, San Angelo, TX. 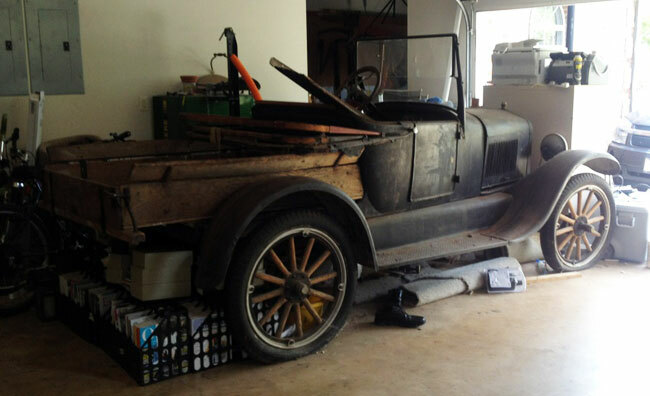 1925 Ford Model T Roadster, Rick Narvaez, San Antonio, TX. 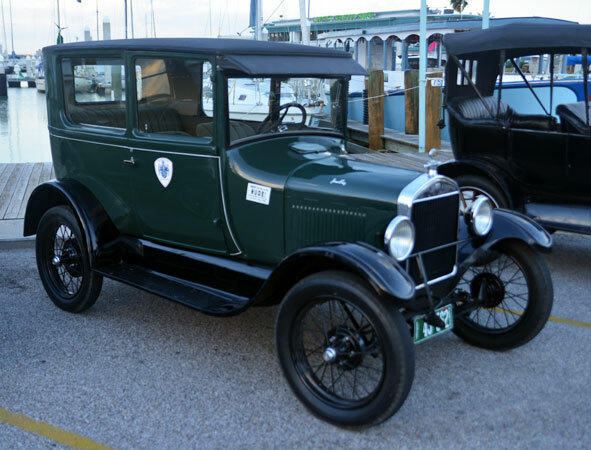 1925 Ford Model T touring car, Hugh Hemphill, San Antonio, TX. 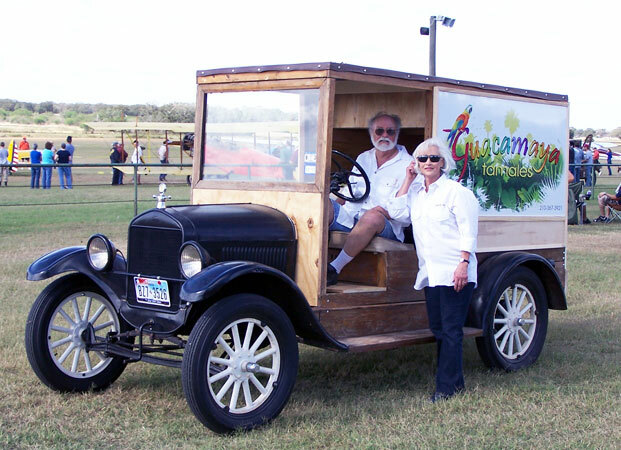 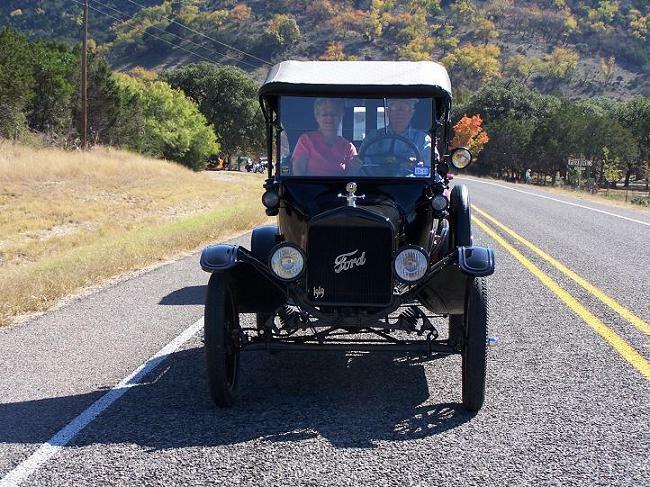 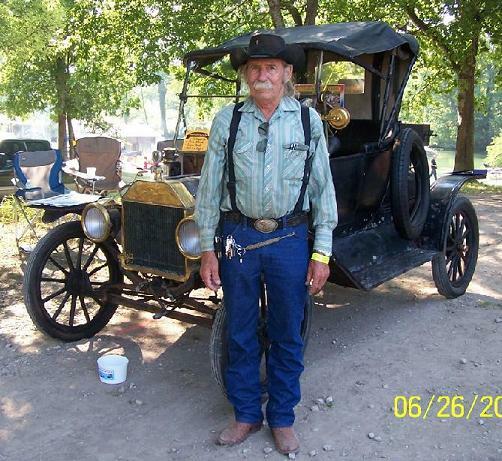 1925 Ford Model T Runabout, Luke Cordes, Schulenbert, TX. 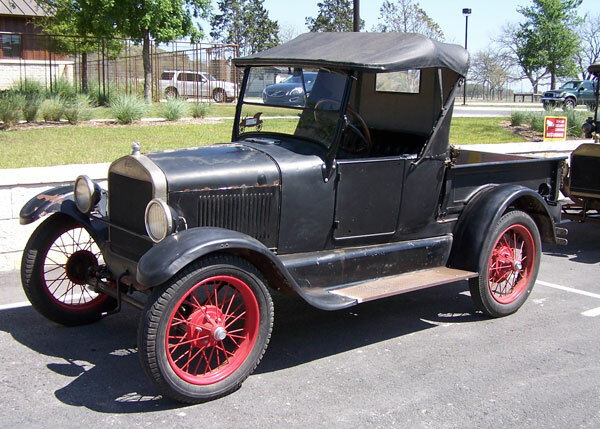 1925 Ford Model T pick-up, Daniel Snell, San Antonio, TX. 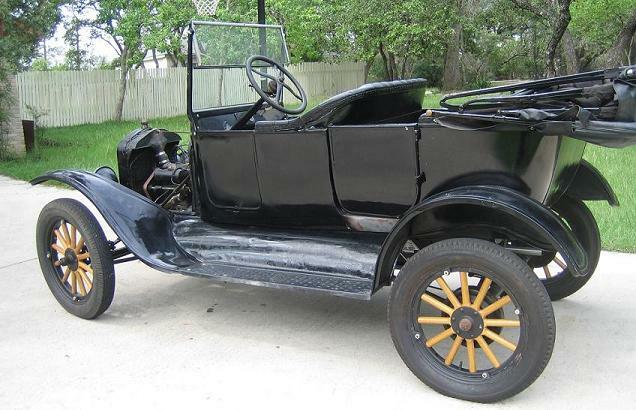 1925 Ford Model T touring car, San Antonio, TX. 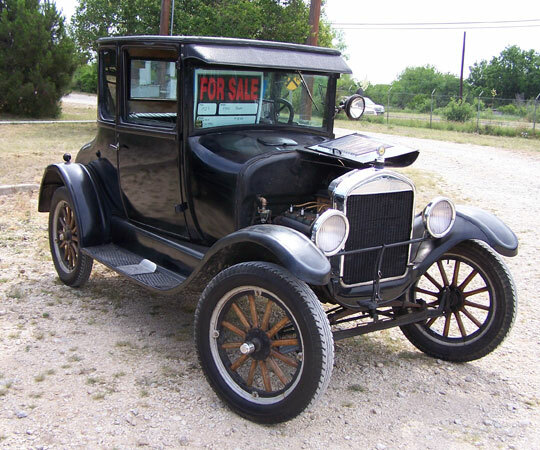 1925 Ford Model T Sedan, John Williams, San Antonio, TX. 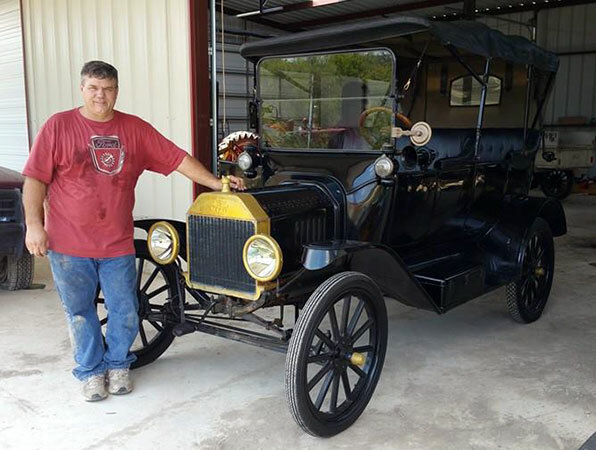 1925 Ford Model T Coupe, Wayne McBryde, Devine, TX. 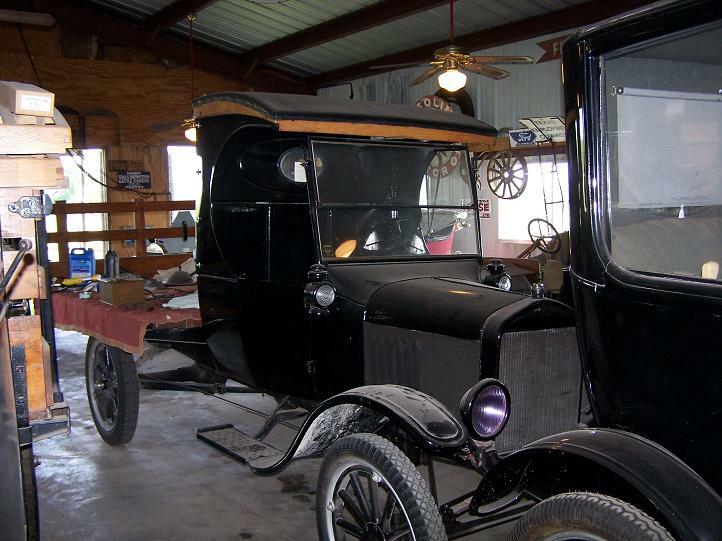 1925 Ford Model T Depot Hack, Al Brooke, San Antonio, TX. 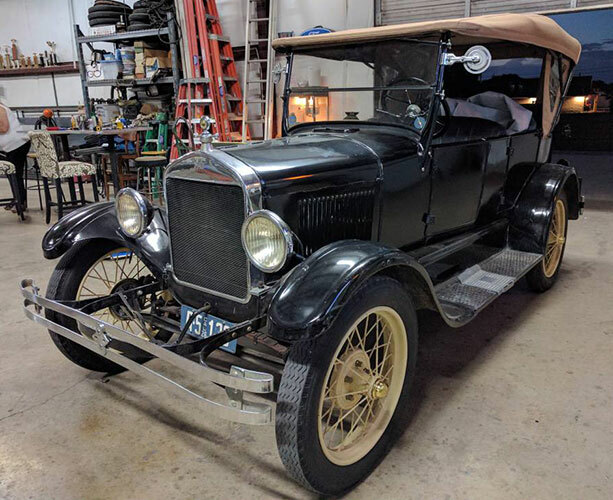 1926 Ford Model T Touring car, Daniel Bratcher, Schertz, TX. 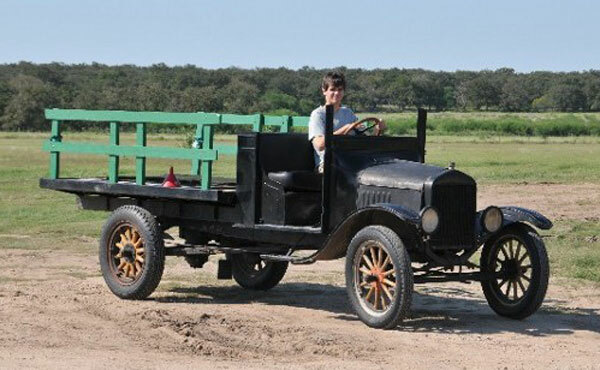 1926 Ford Model T 2-Seat Runabout Pickup, Daniel Bratcher, Floresville, TX. 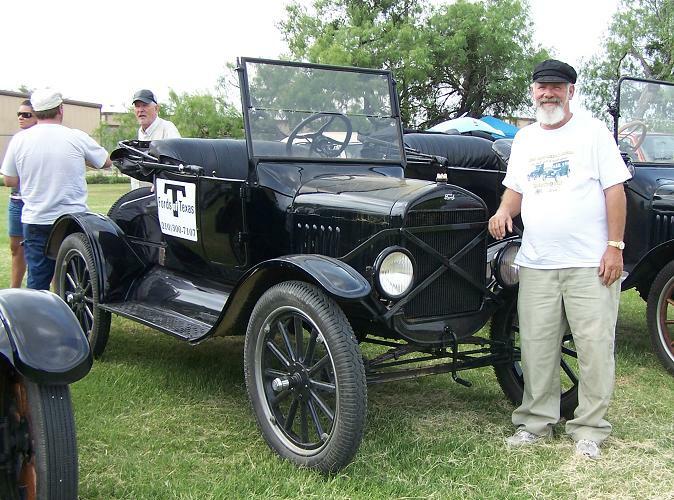 1926 Ford Model T Touring car, Mike Mackechney, San Antonio, TX. 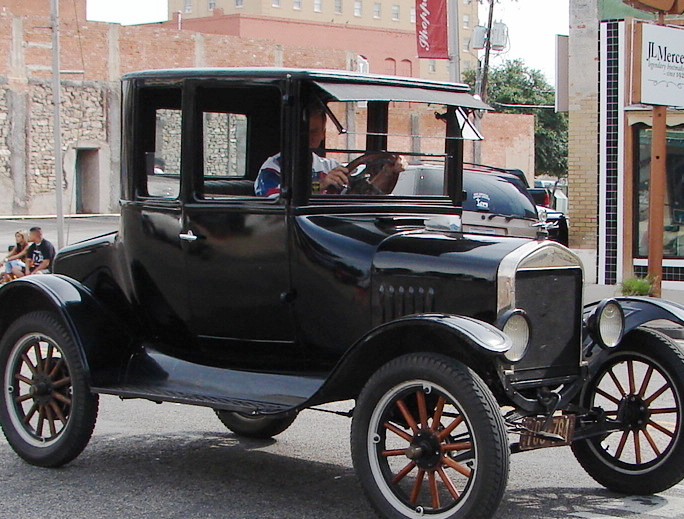 1926 Ford Model T Touring car, Ronnie Bitterly, San Antonio, TX. 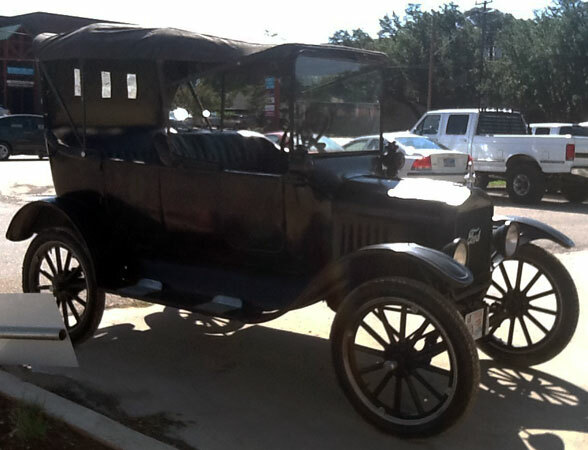 1926 Ford Model T Touring car, Thomas Supak, Fayetteville, TX. 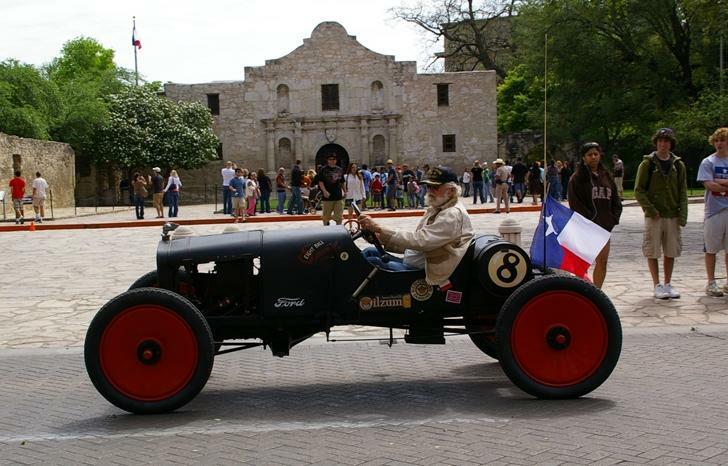 1926 Ford Model T Speedster, Mike Mackechney, San Antonio, TX. 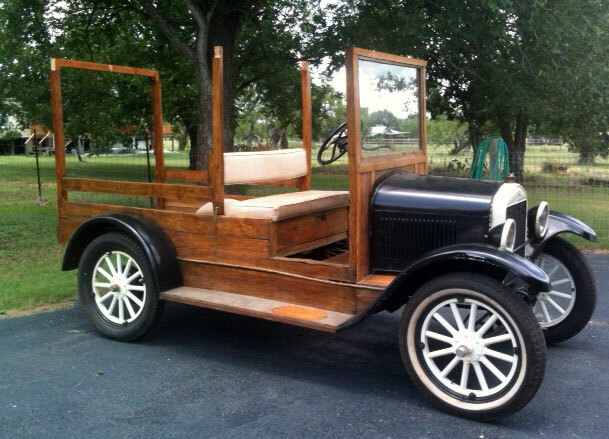 1926 Ford Model T 2-Seat Runabout Pickup, Jerry King, San Antonio, TX. 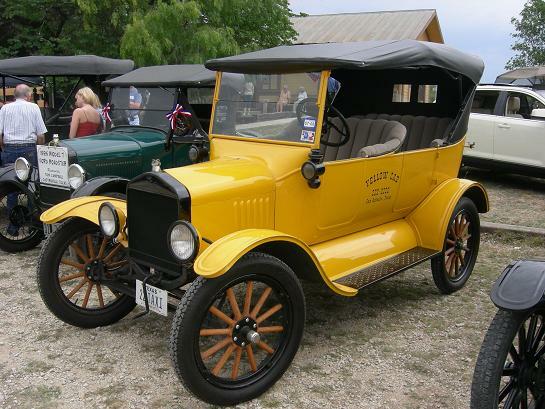 1926 Ford Model T 2-Seat Runabout, Tom Campbell, Castroville, TX. 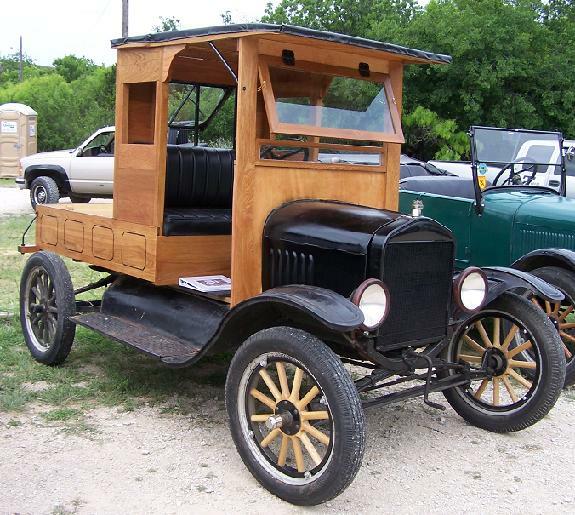 1926 Ford Model T Modified Pickup (Cut down Fordor), Keith Nilsson, San Antonio, TX. 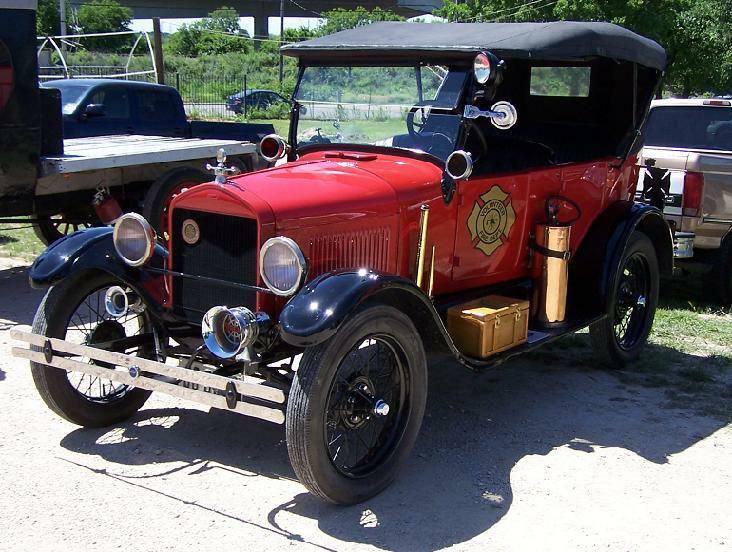 1926 Ford Model T Fire Chief, Bob Heisterman, Port Aransas, TX. 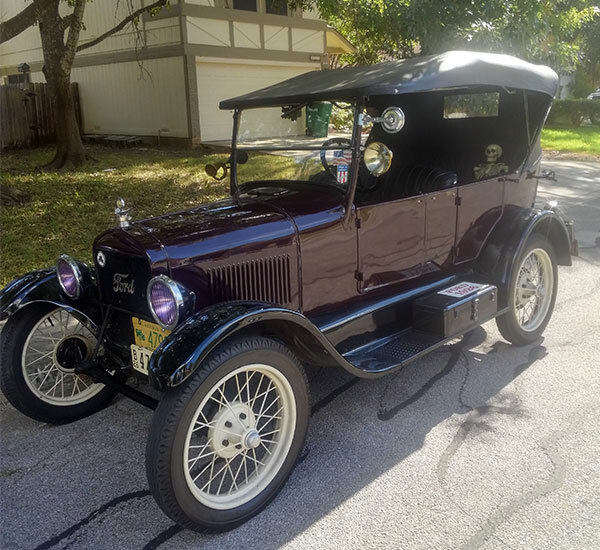 1926 Ford Model T Runabout, David Barrett, San Marcos, TX. 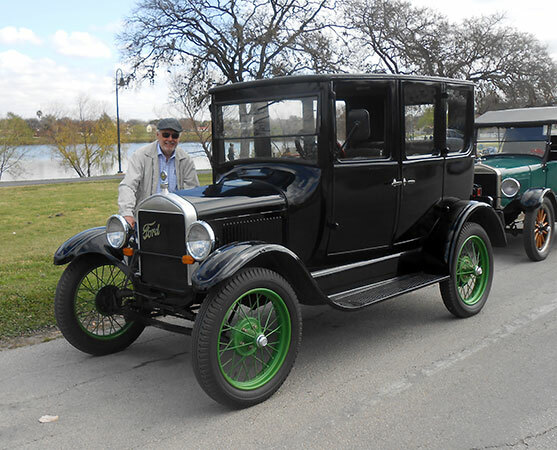 1926 Ford Model T Sedan, Ernie Clauss, San Antonio, TX. 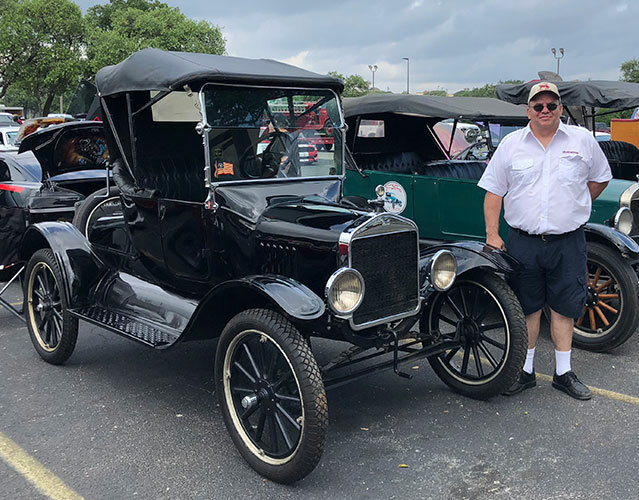 1926 Ford Model T Doctor's Coupe, Greg Williams, San Antonio, TX. 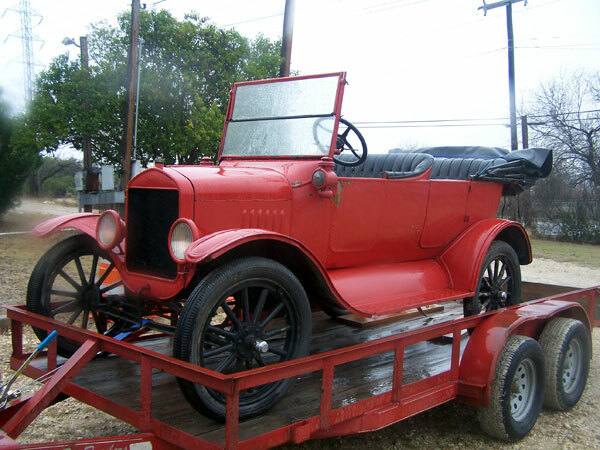 1926 Ford Model T Doctor's Coupe, Tom Baker, San Antonio, TX. 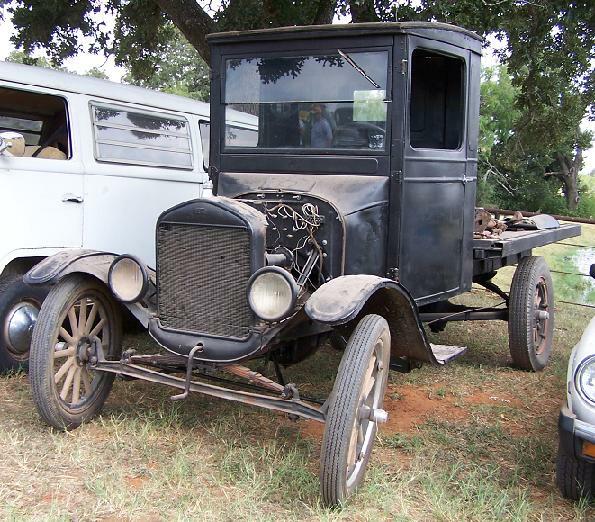 1926 Ford Model T Huckster Wagon, Mitchell Dulnig, Sisterdale, TX. 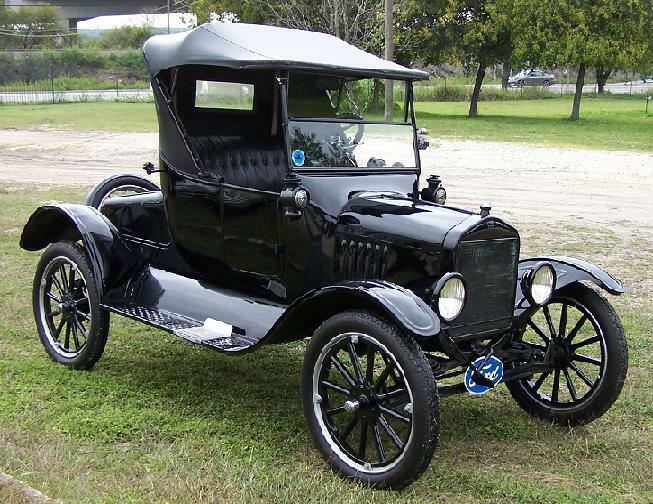 1926 Ford Model T Fordor Closed Sedan, Lousi Persatt, San Antonio, TX. 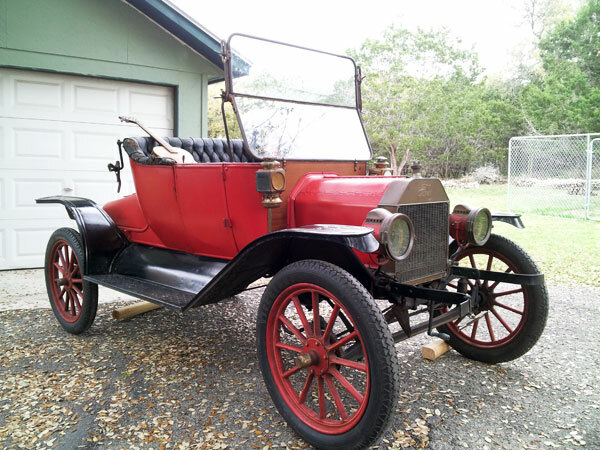 1926 Ford Model T 2-Seat Runabout, Charlie Untermeyer, San Antonio, TX. 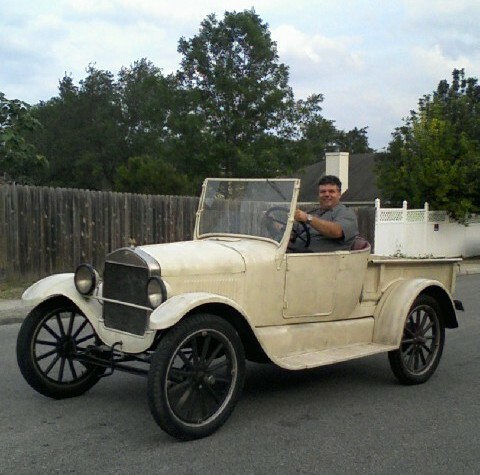 1926 Ford Model T Tudor, Patrick Christensen, San Antonio, TX. 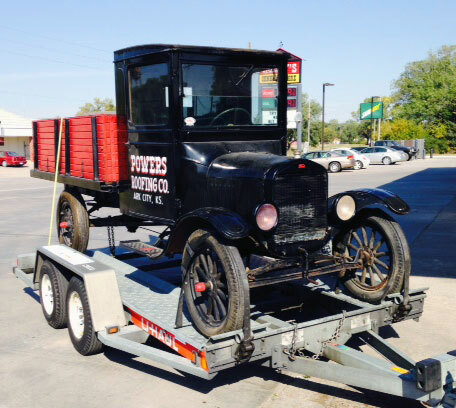 1926 Ford Model T huckster truck, Homer Holland, San Antonio, TX. 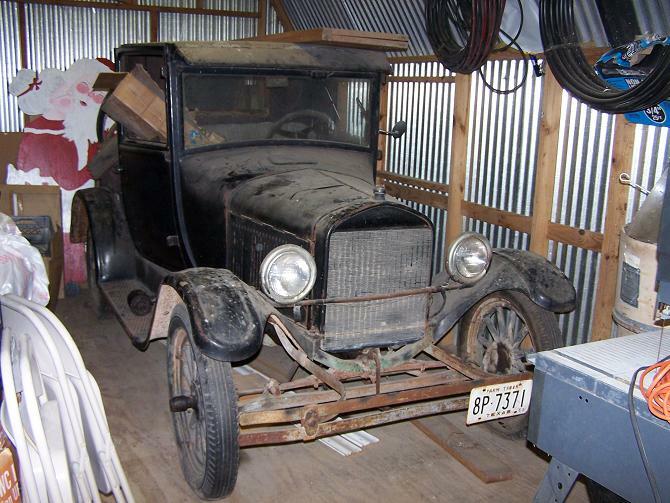 1926 Ford Model T In Progress, Sonny House, Lockhart, TX. 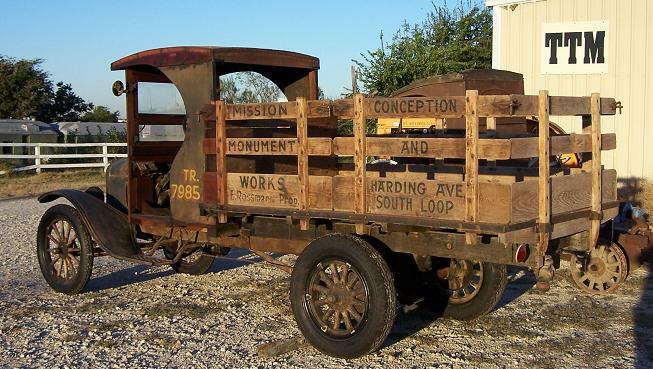 1926 Ford Model TT truck, Bob Abbey, San Antonio, TX. 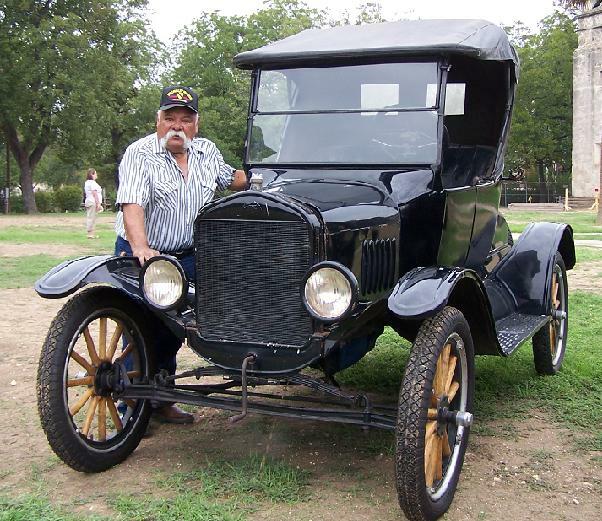 1926 Ford Model T 2-Seat Runabout Pickup, Tom Supak, Fayetteville, TX. 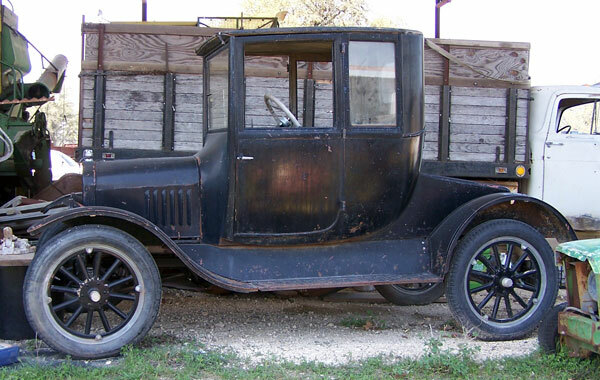 1926 Ford Model T touring car, John daily, Boerne, TX. 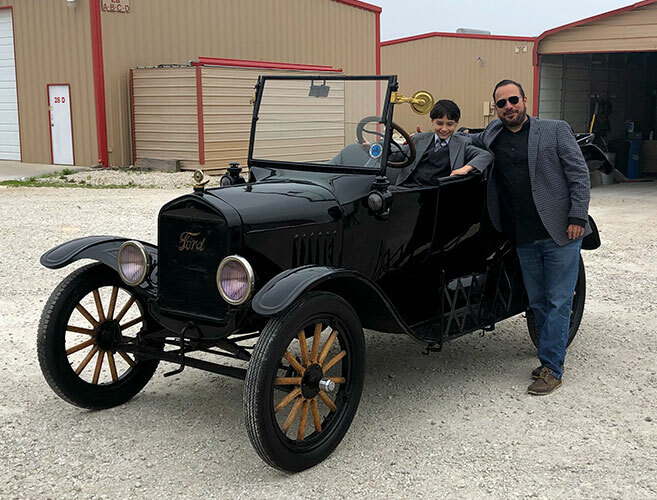 1926 Ford Model T Rajo Speedster, Henry Tijerina, San Antonio, TX. 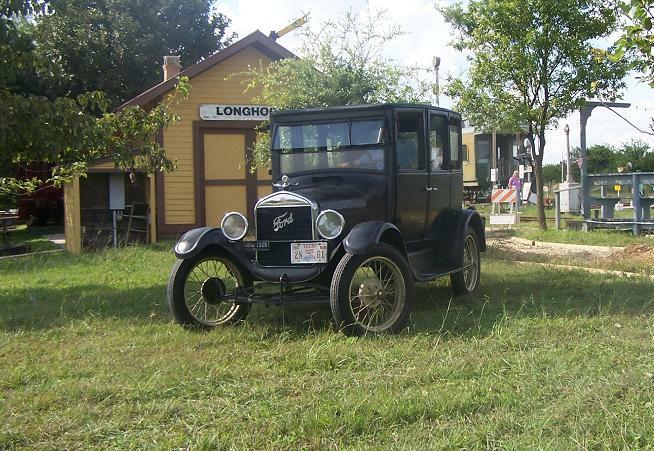 1927 Ford Model T Coupe, Sonny House, Lockhart, TX. 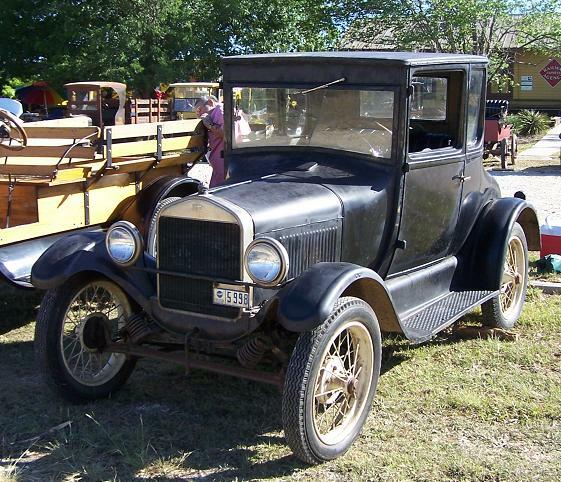 1927 Ford Model T Doctor's Coupe, Richard Horvath, Lockhart, TX. 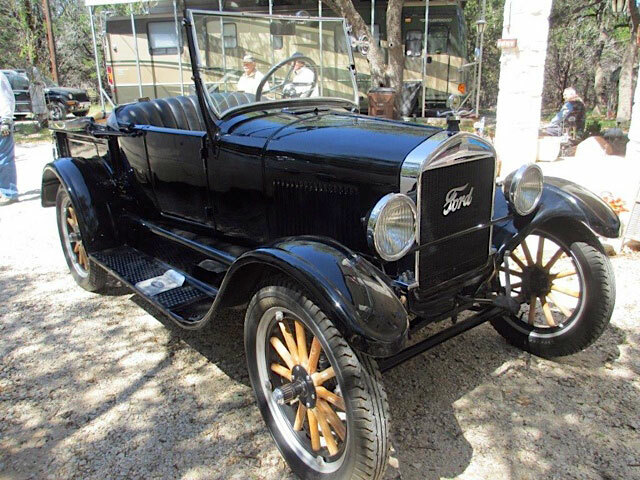 1927 Ford Model T Fordor, Louis Miorelli, San Antonio, TX. 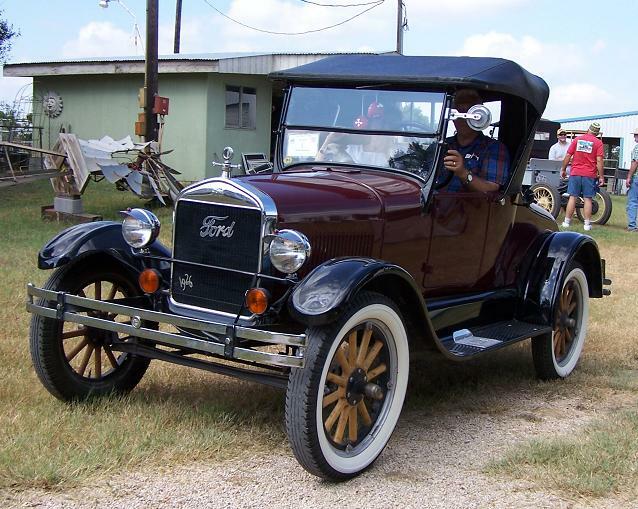 1927 Ford Model T Doctor's coupe, Shelby Koehler, Floresville, TX. 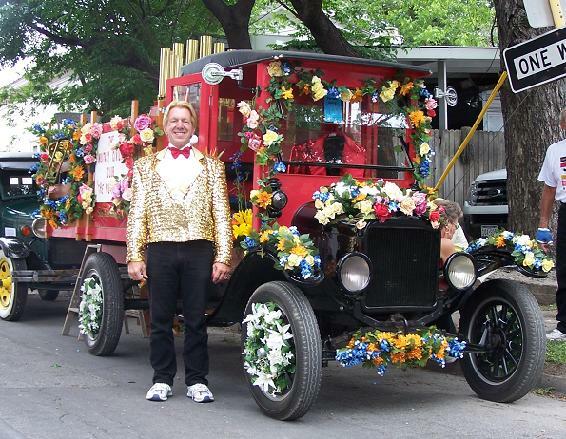 1927 Ford Model T Runabout, Dan Judson, San Antonio, TX. 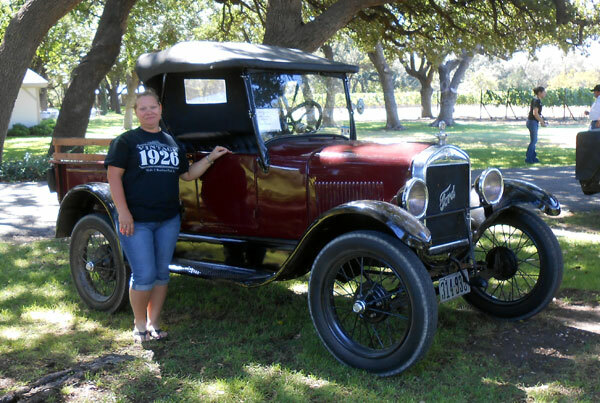 1927 Ford Model T Touring Car, Carolyn Coyne, Boerne, TX. 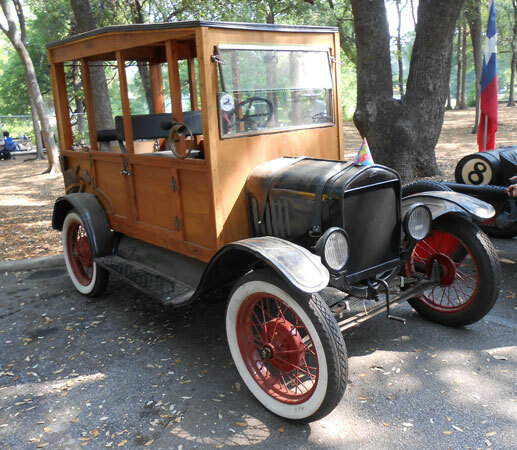 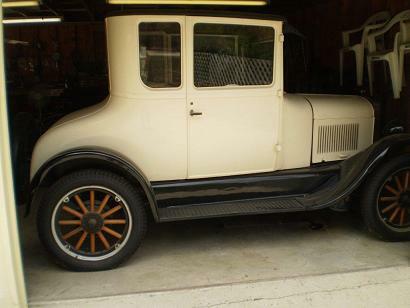 1927 Ford Model Tudor, Homer Holland, San Antonio, TX. 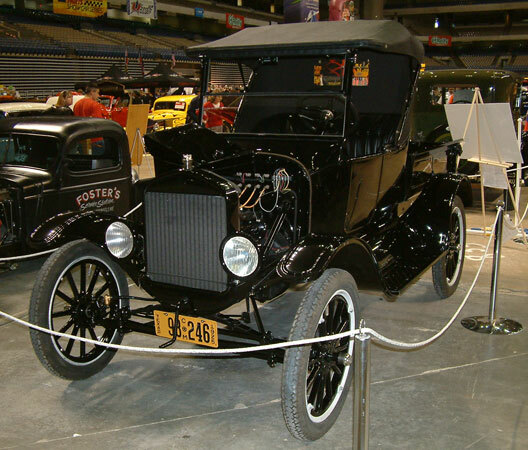 1927 Ford Model T Fordor, Bob Abbey, San Antonio, TX. 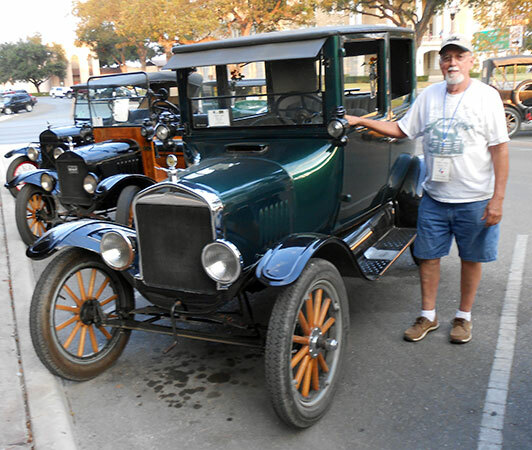 1927 Ford Model T Coupe, Albert Triplett, San Antonio, TX.